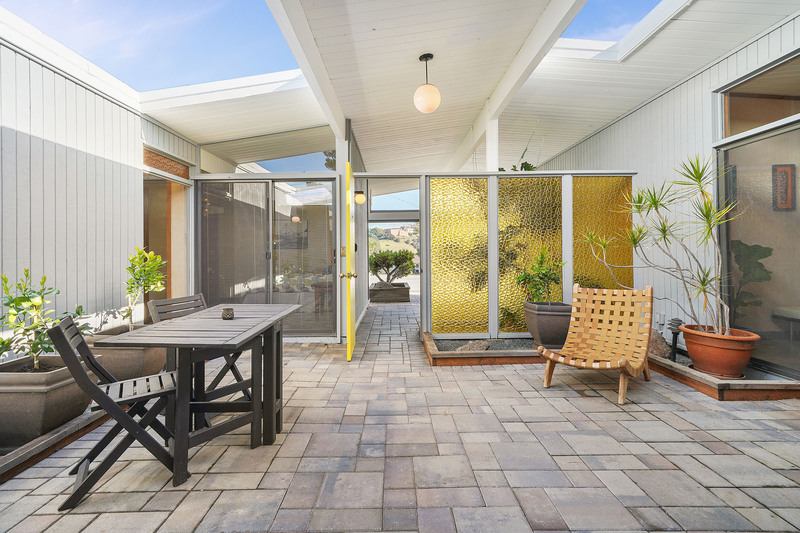 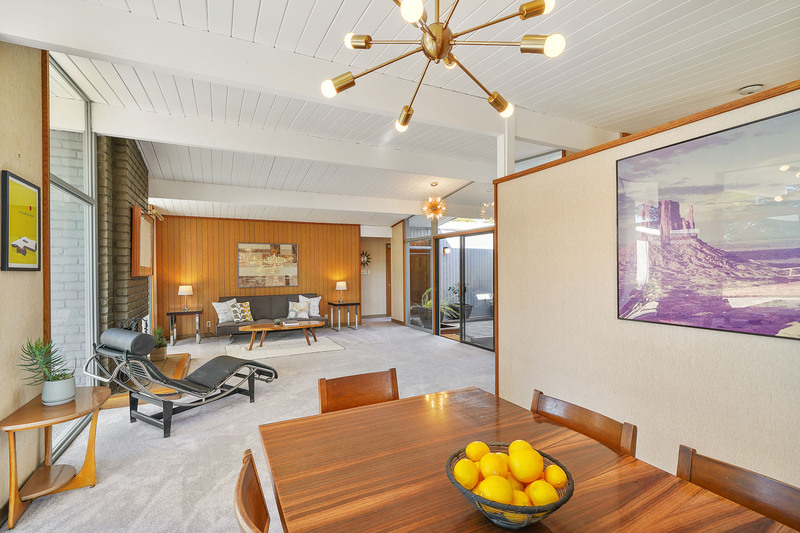 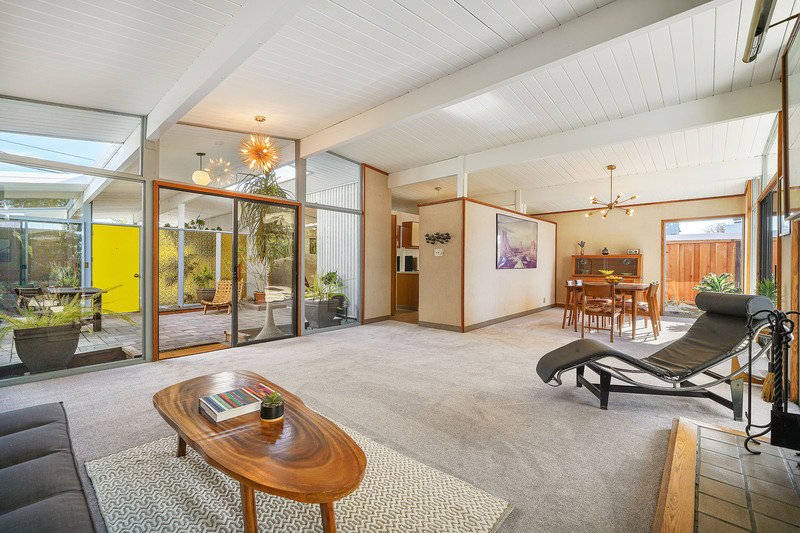 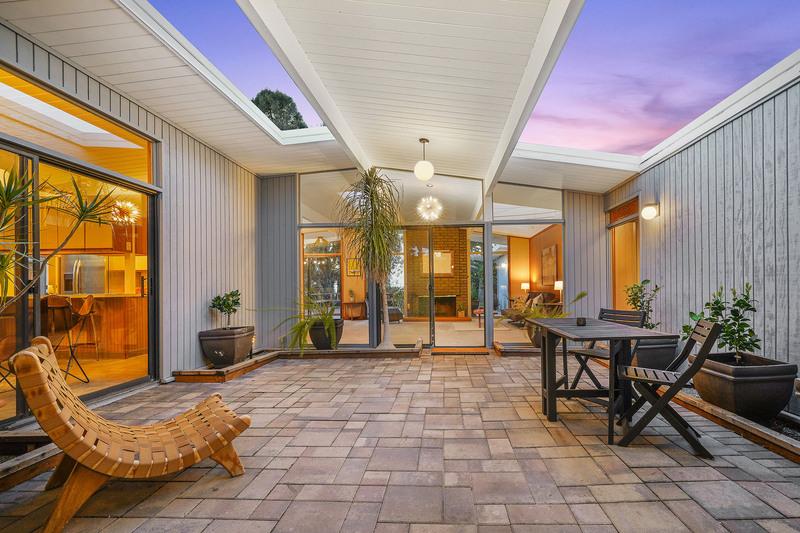 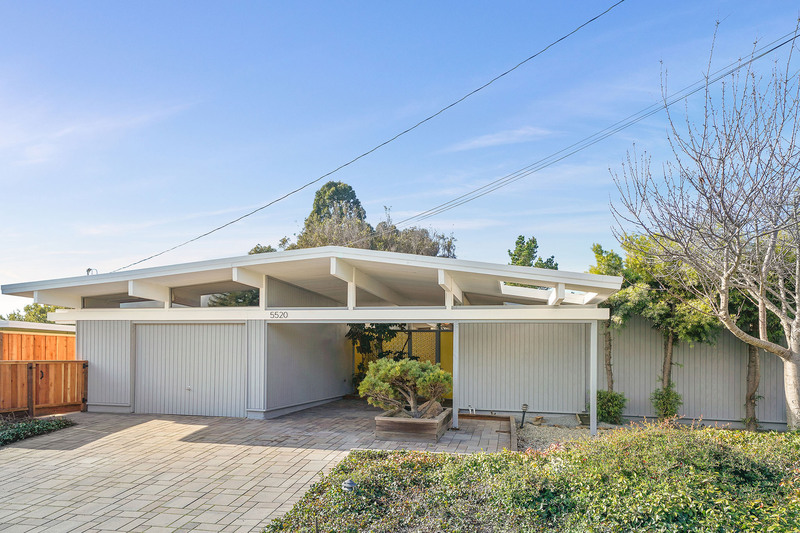 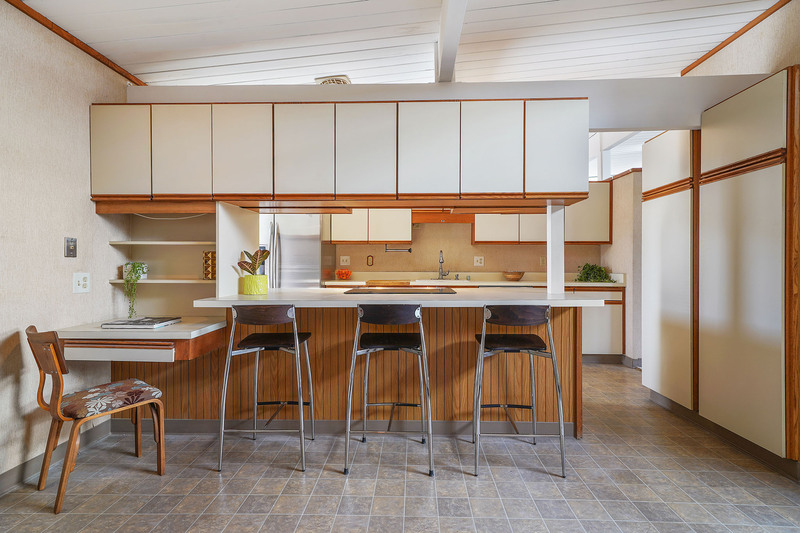 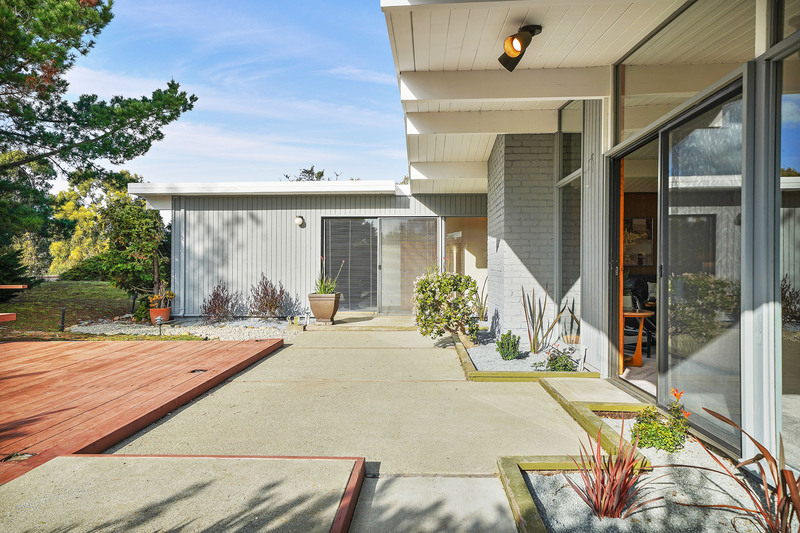 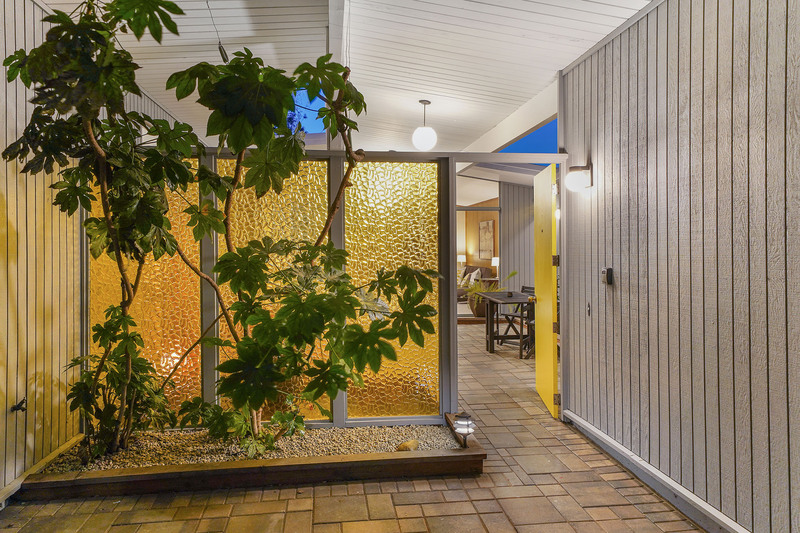 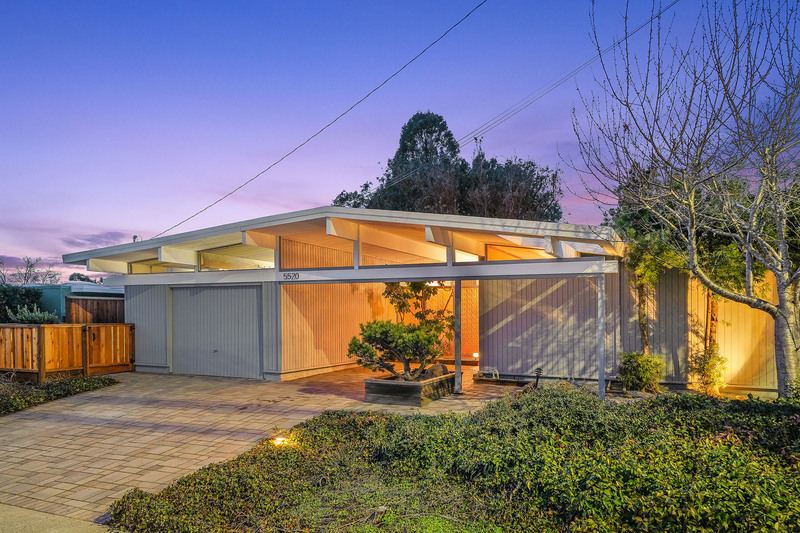 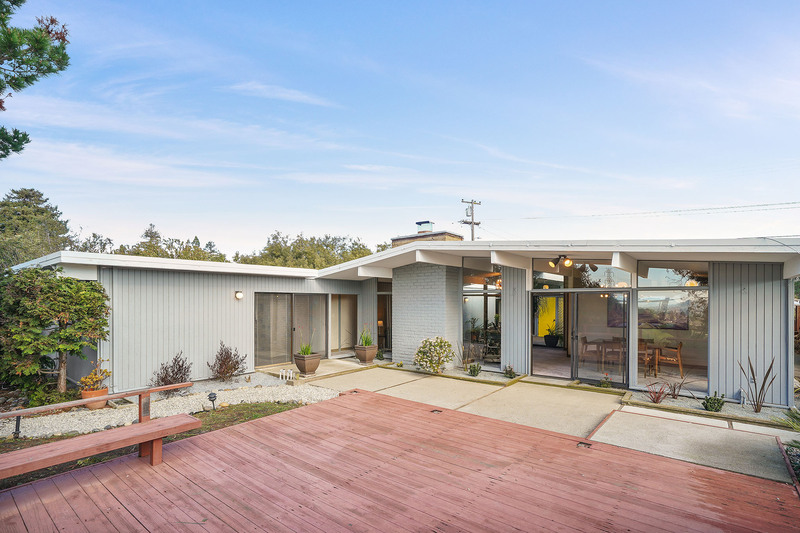 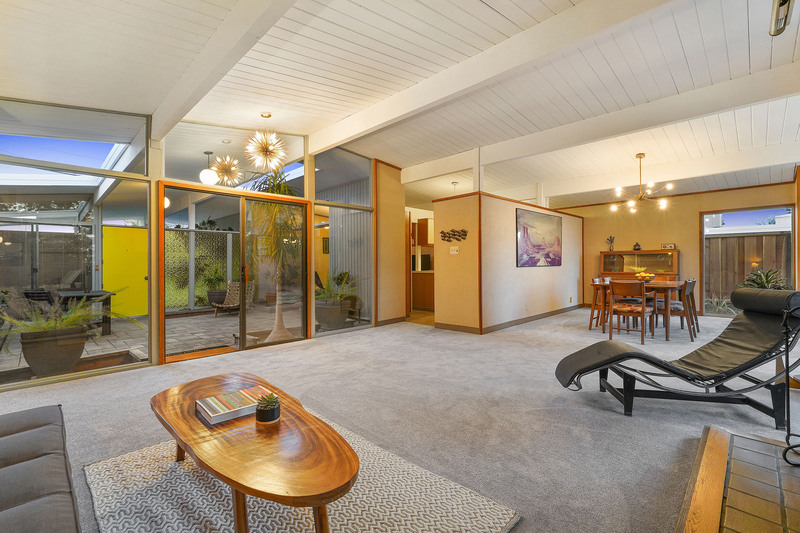 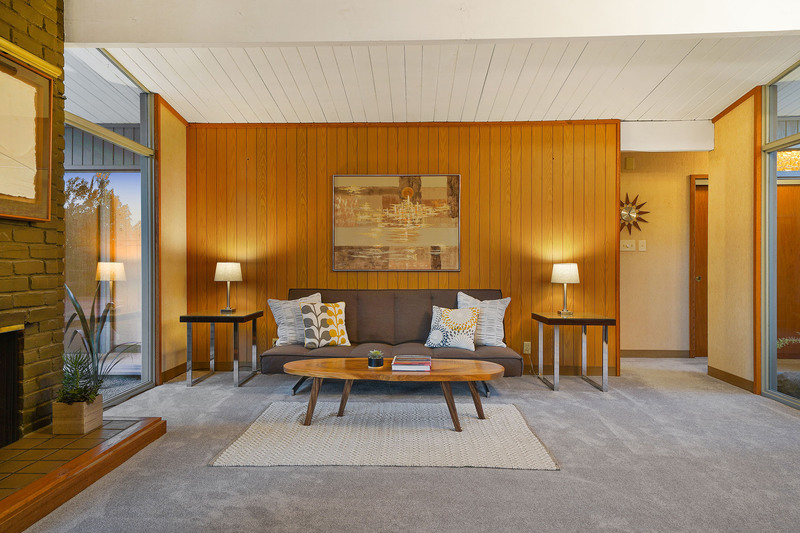 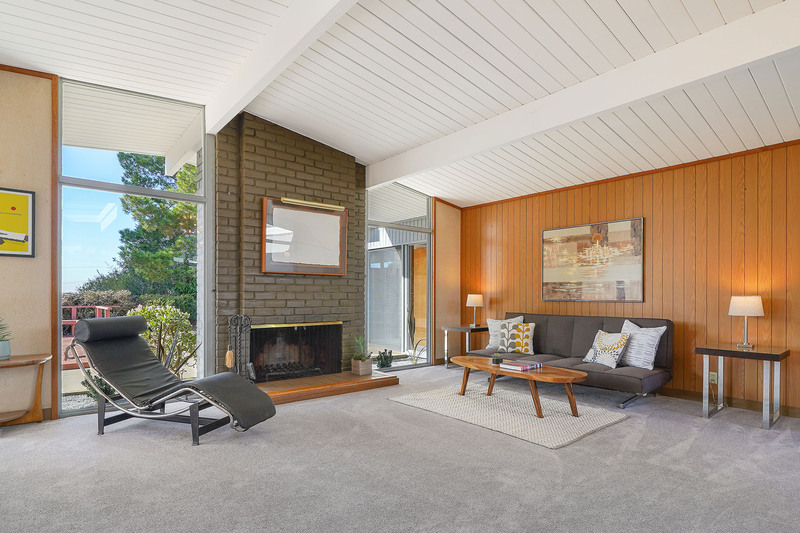 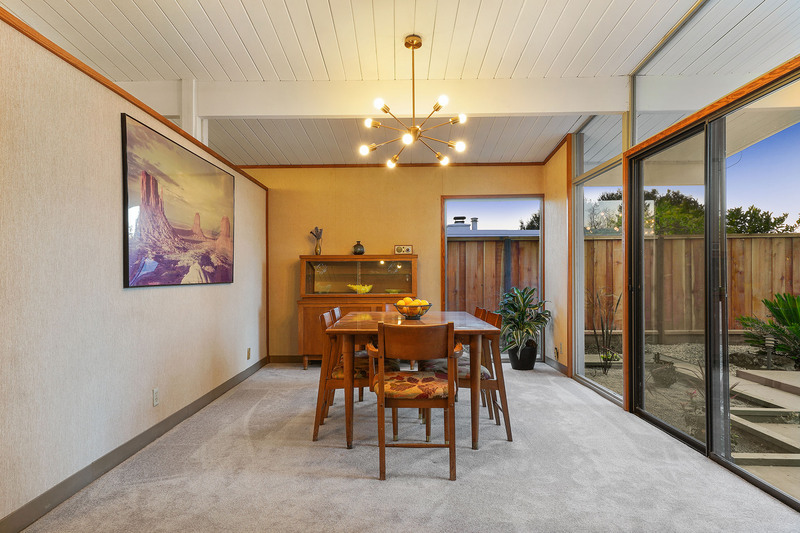 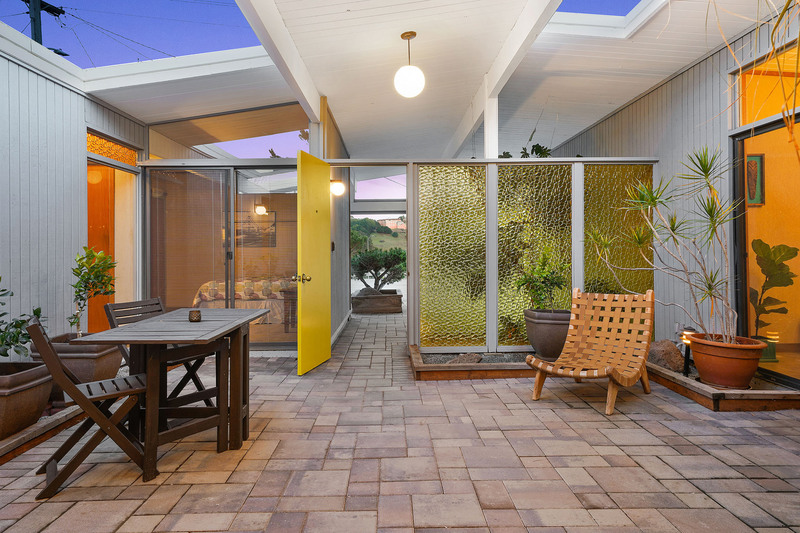 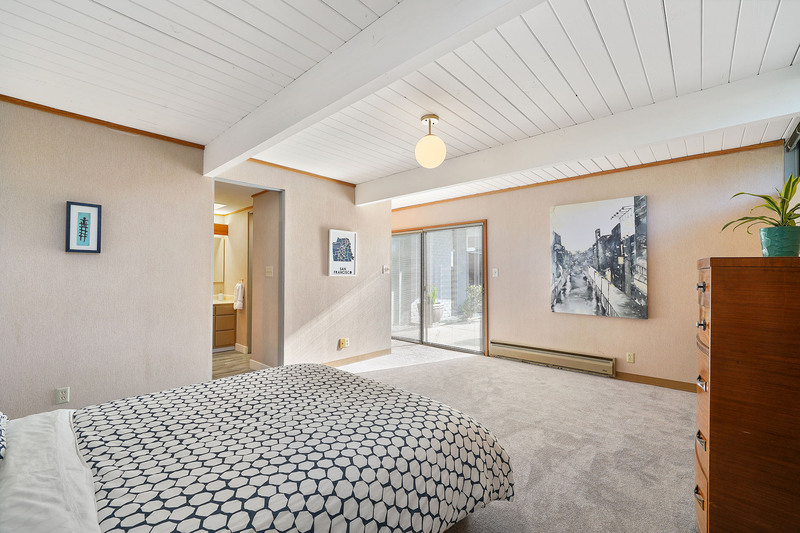 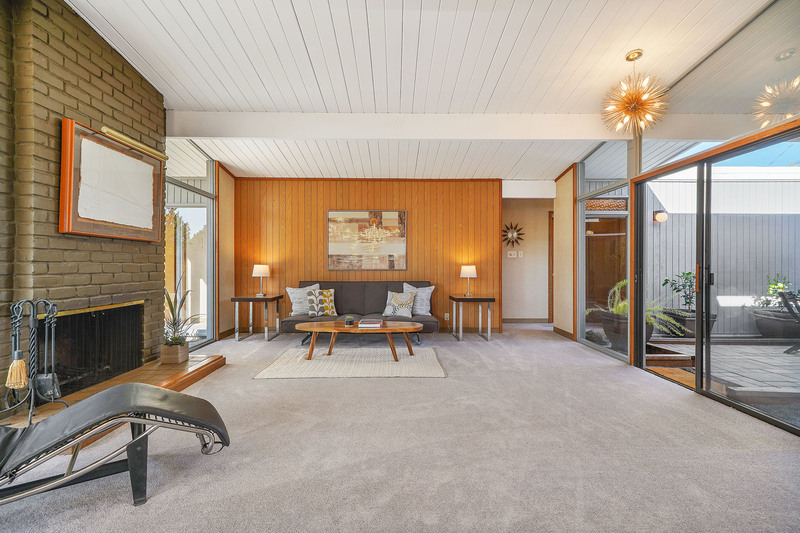 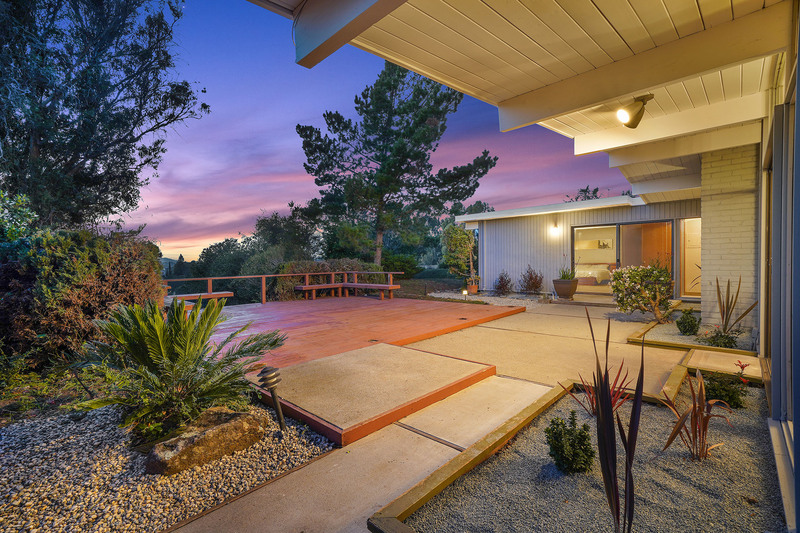 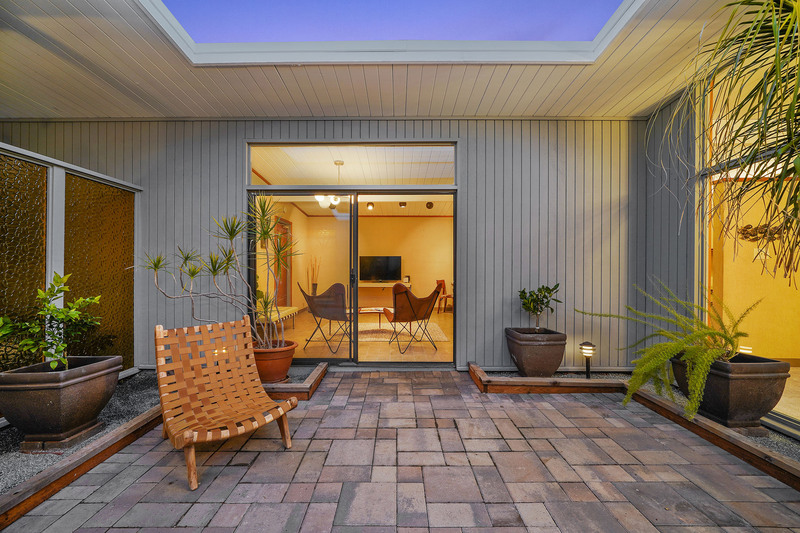 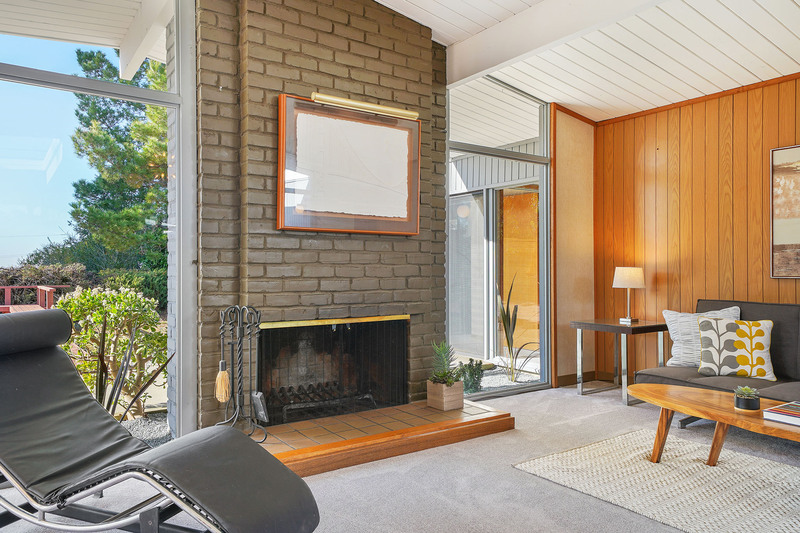 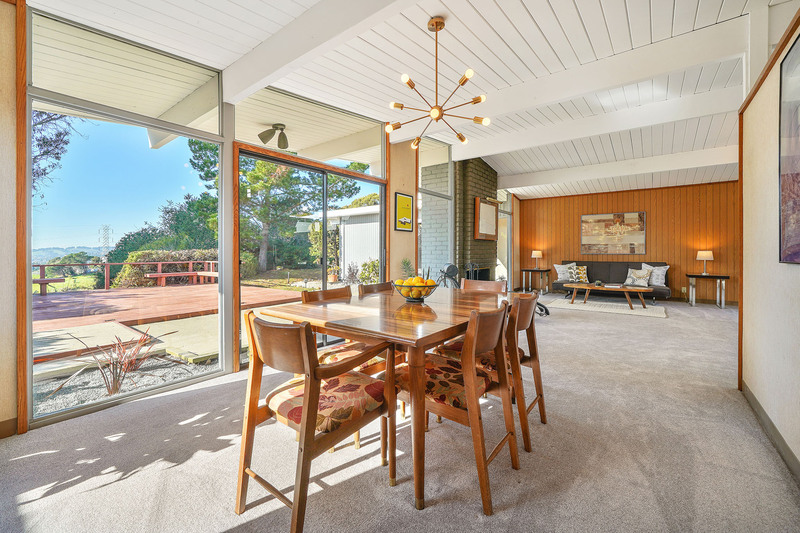 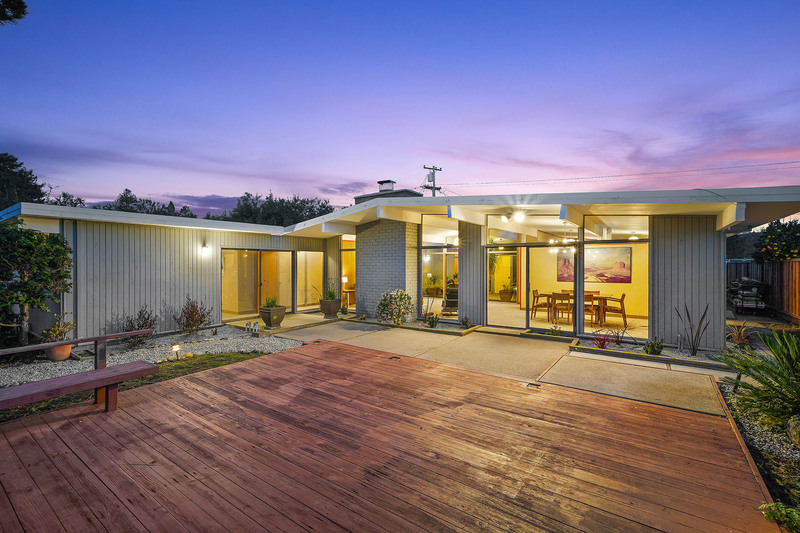 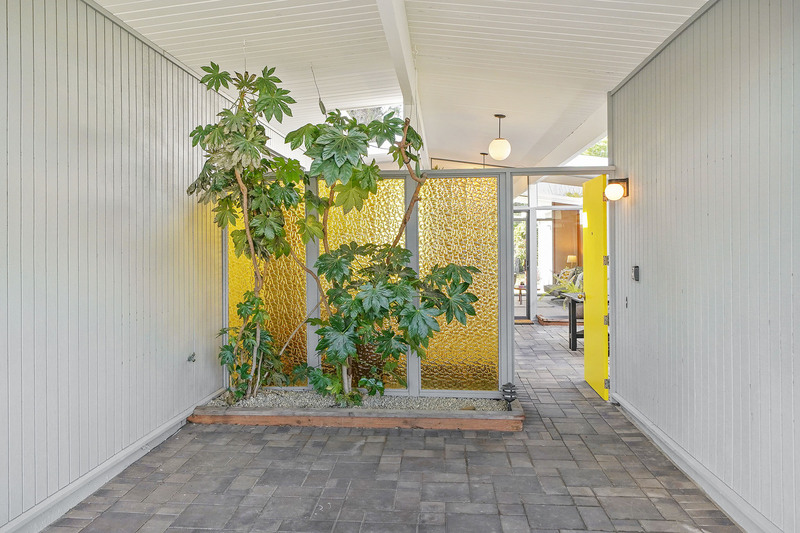 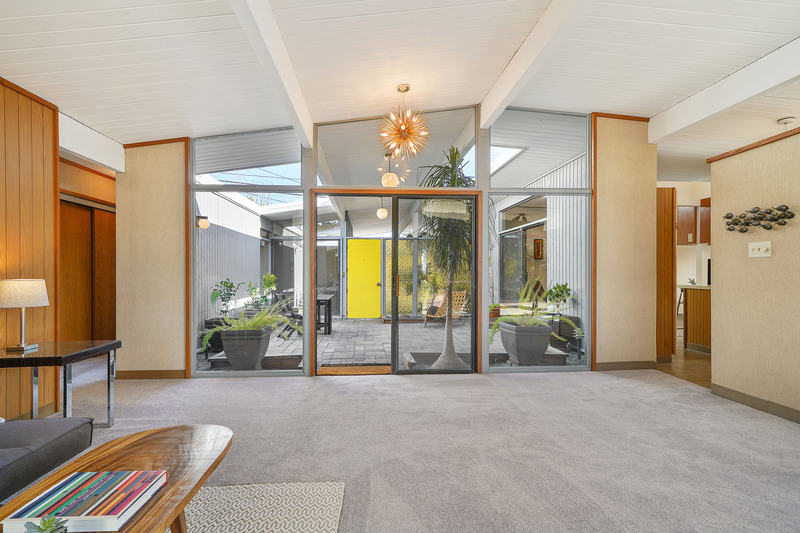 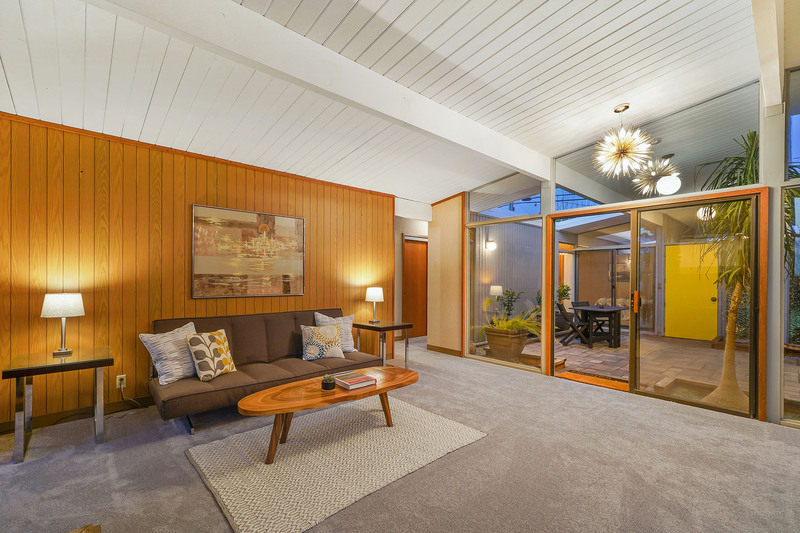 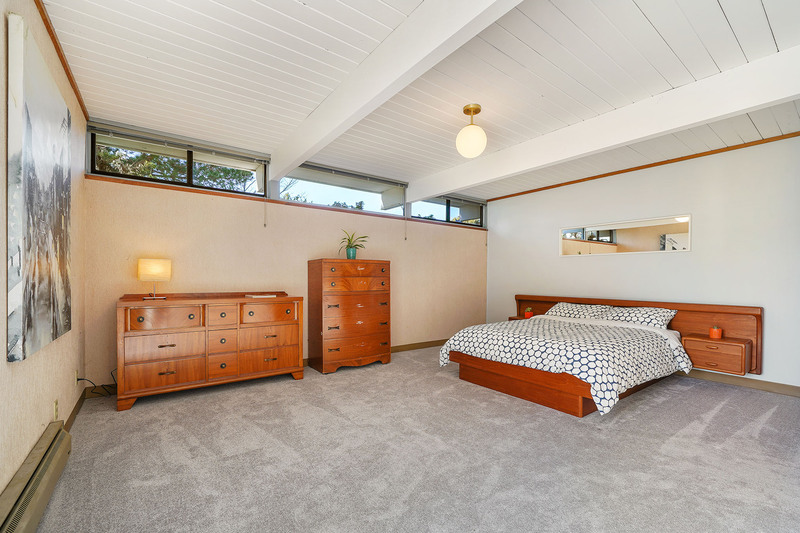 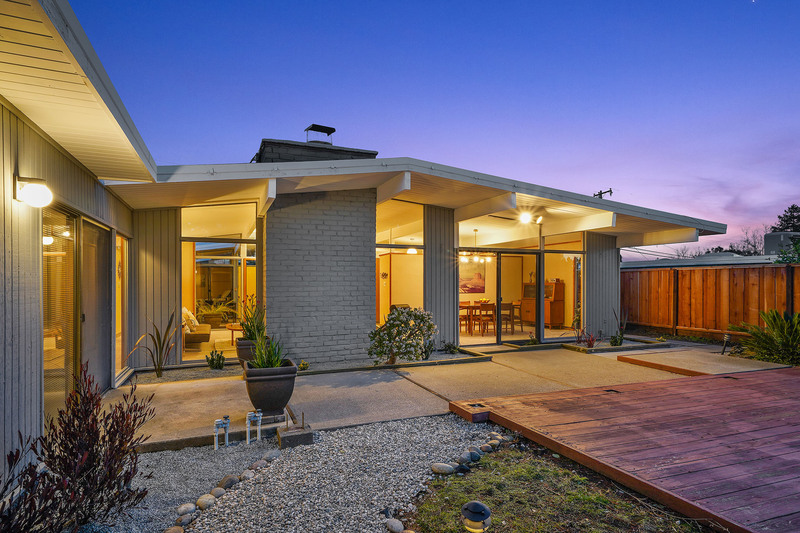 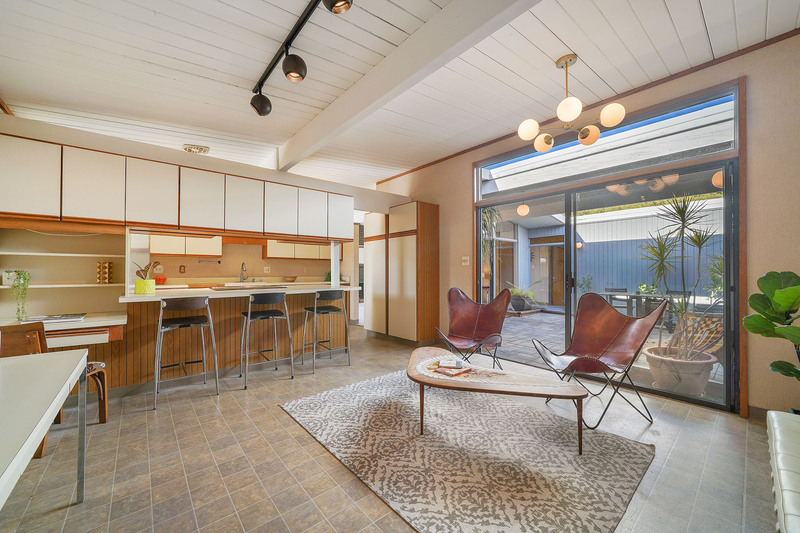 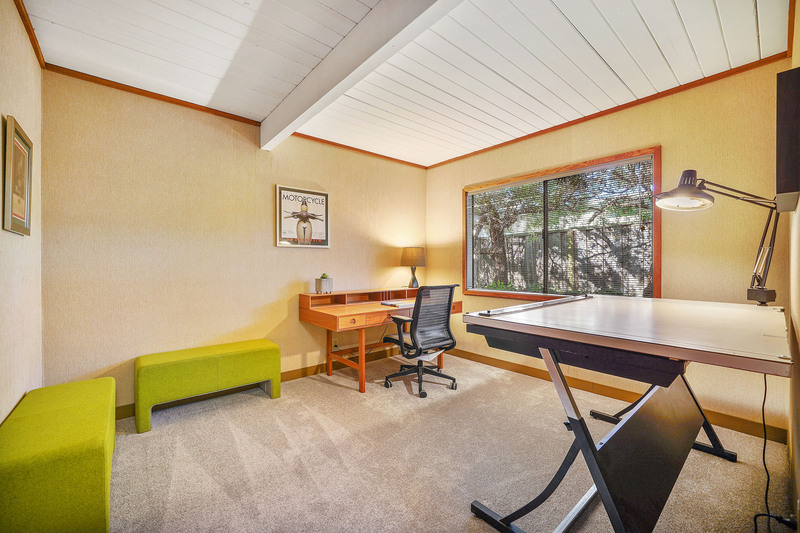 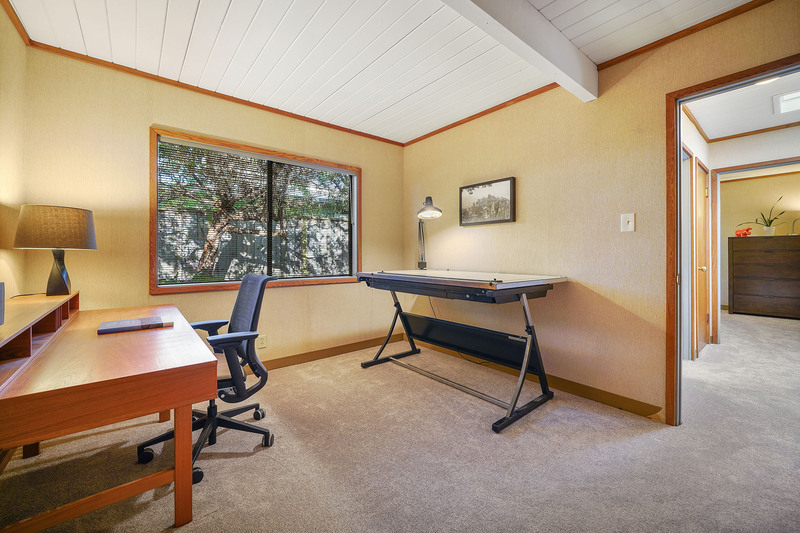 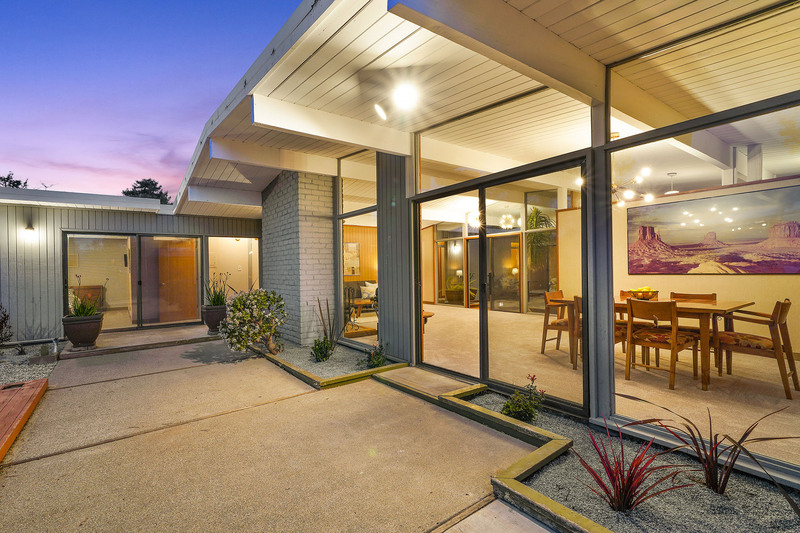 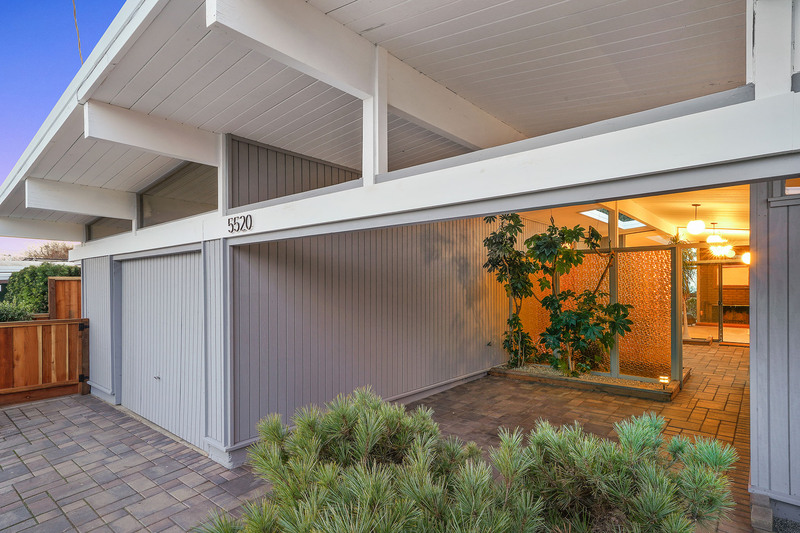 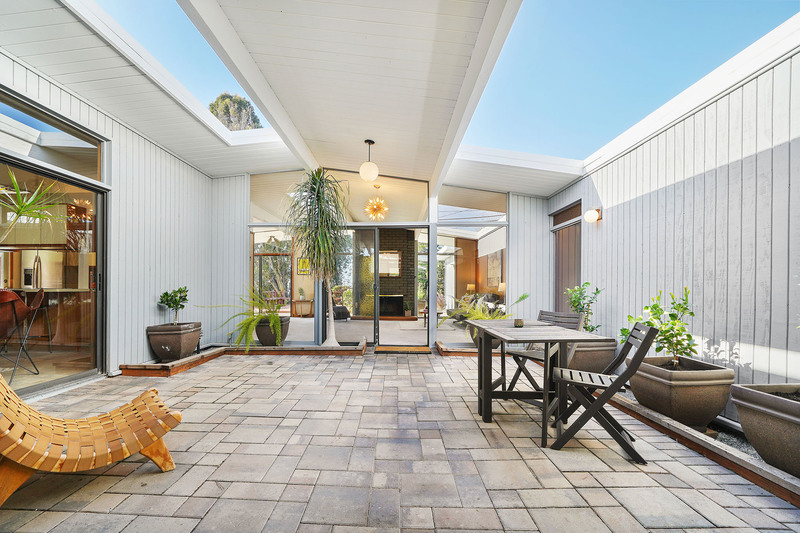 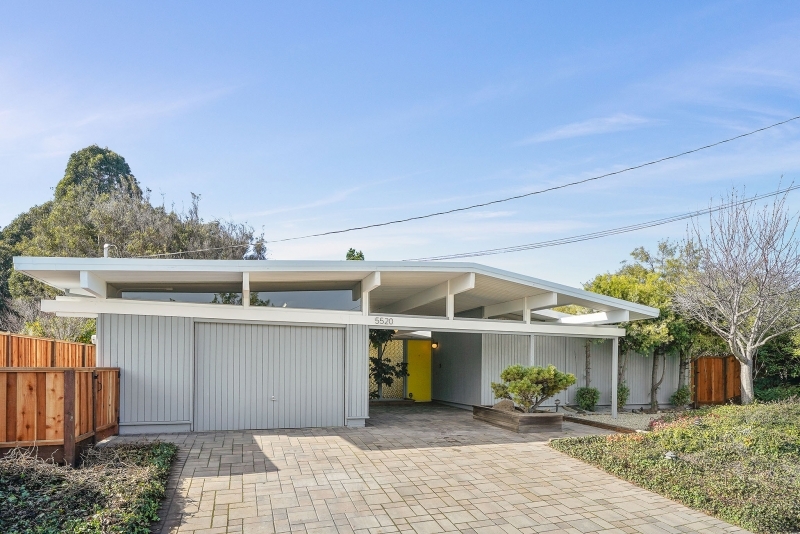 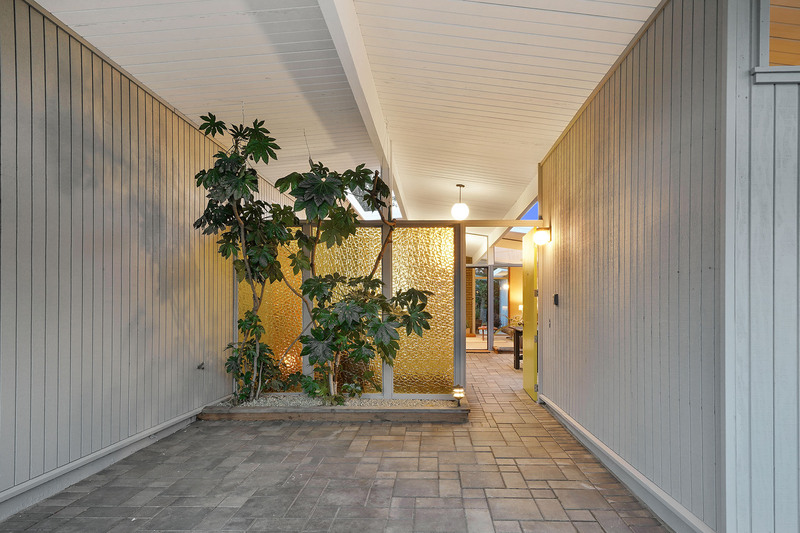 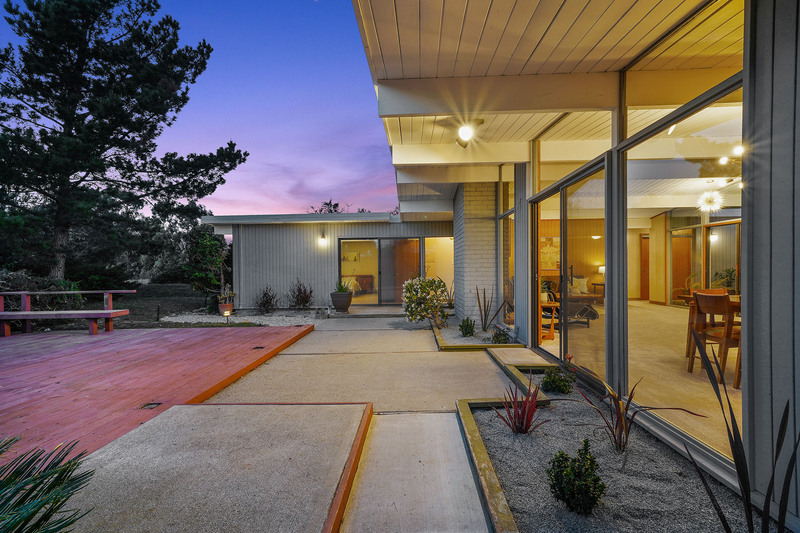 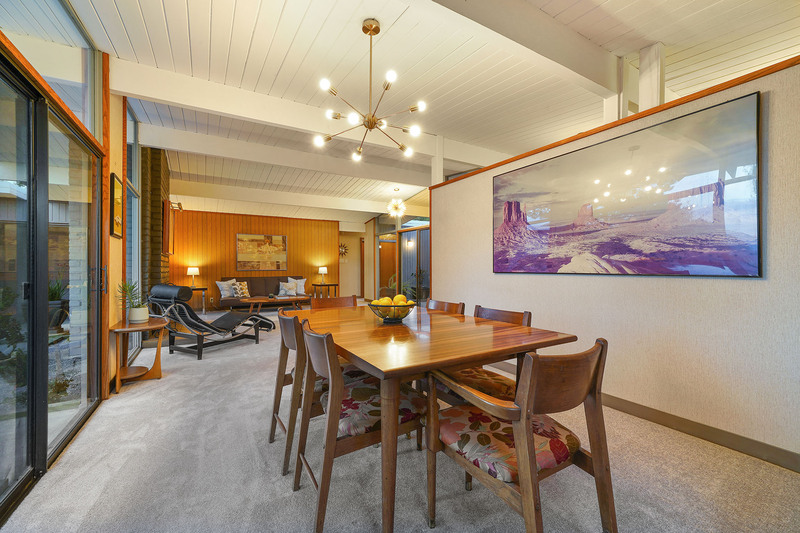 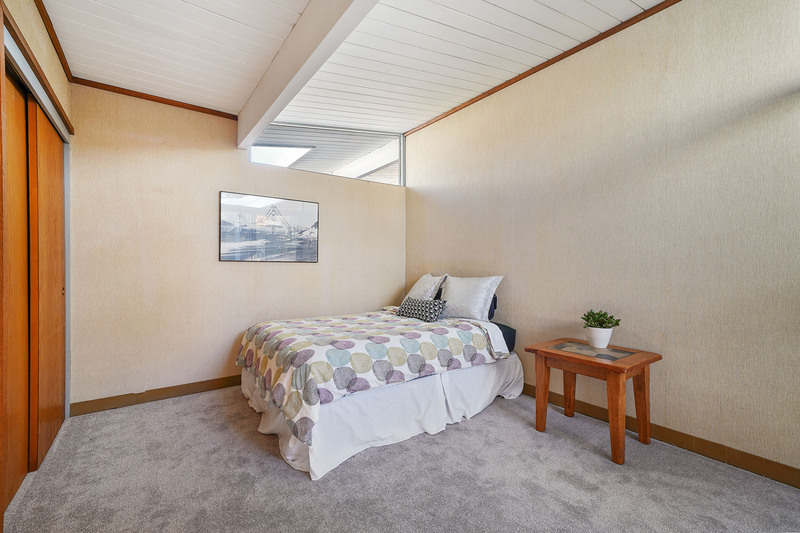 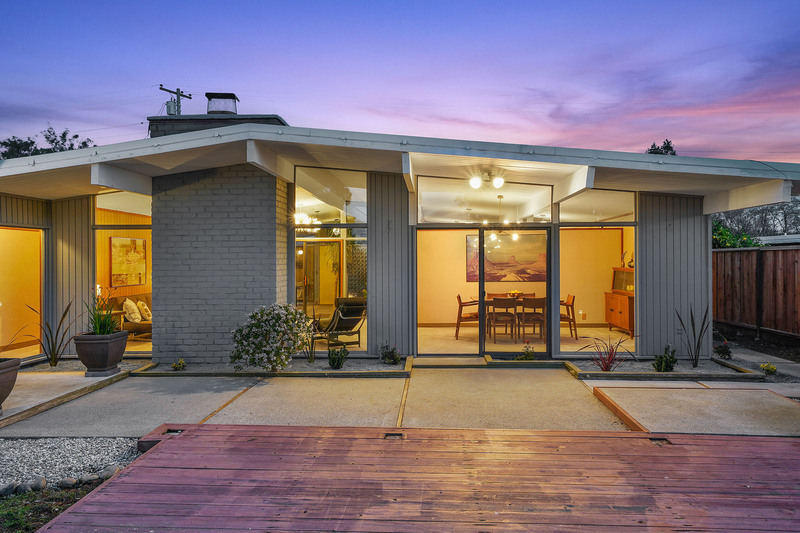 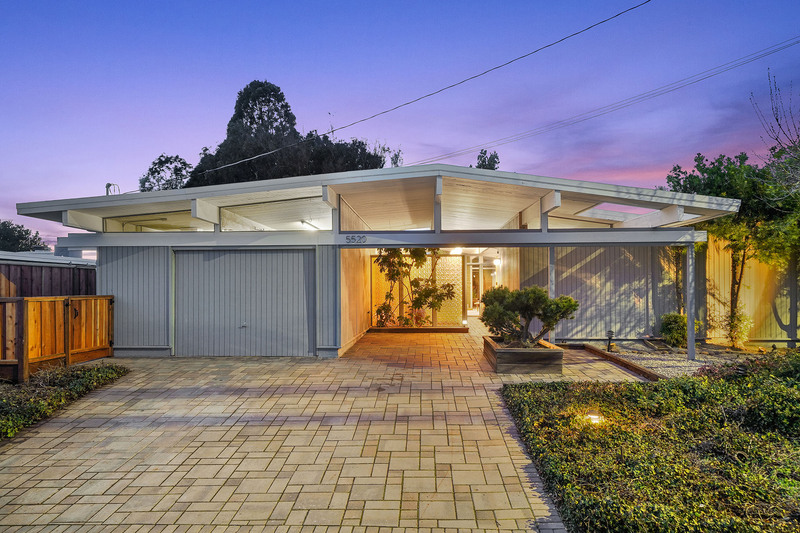 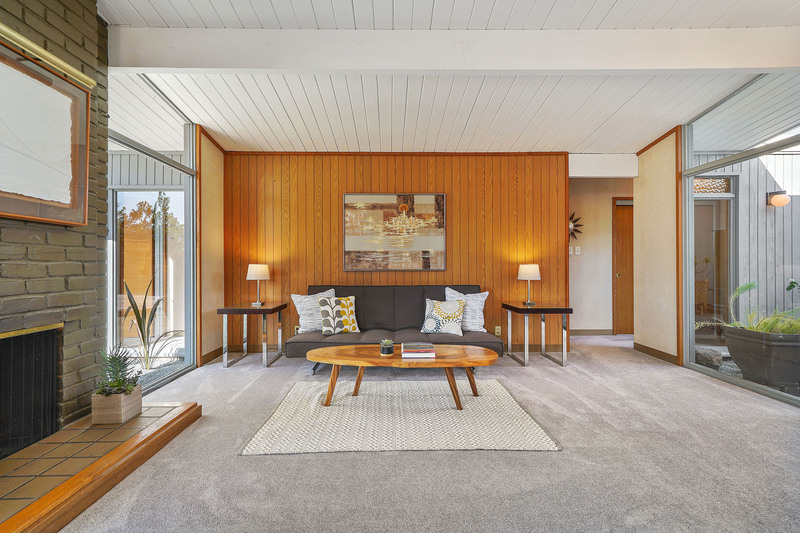 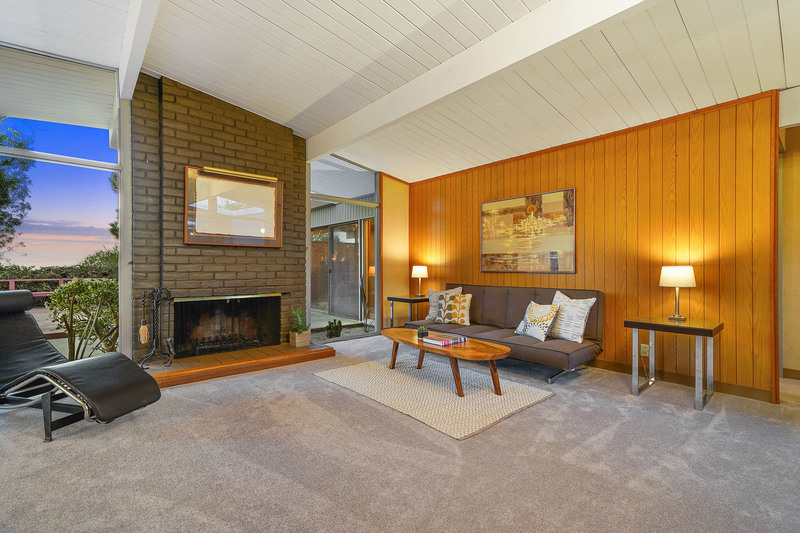 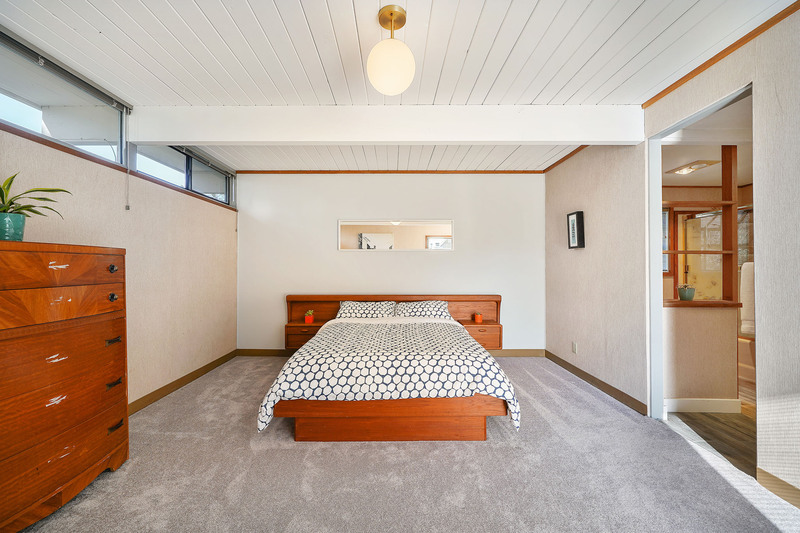 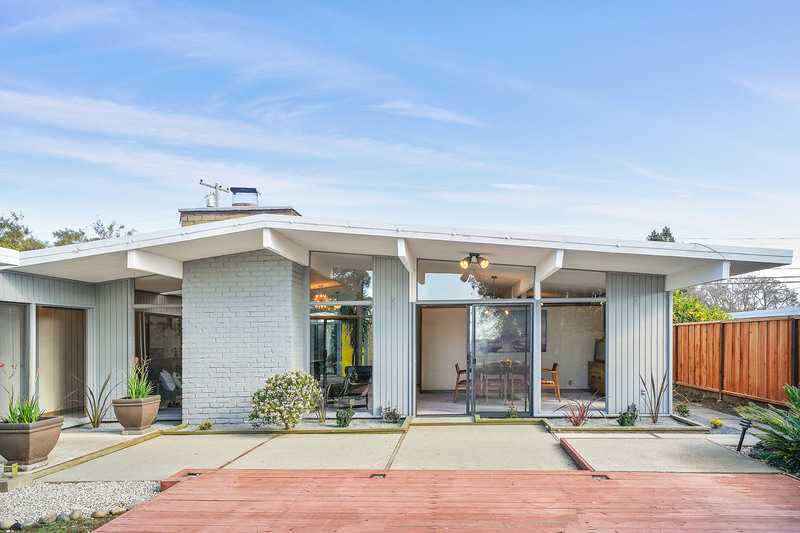 First time on the market in over 30 years for this sensational mid-century modern gem designed by legendary architect firm Emmons and Jones, and built by Joe Eichler in 1961 during the heyday of the mid-century movement. 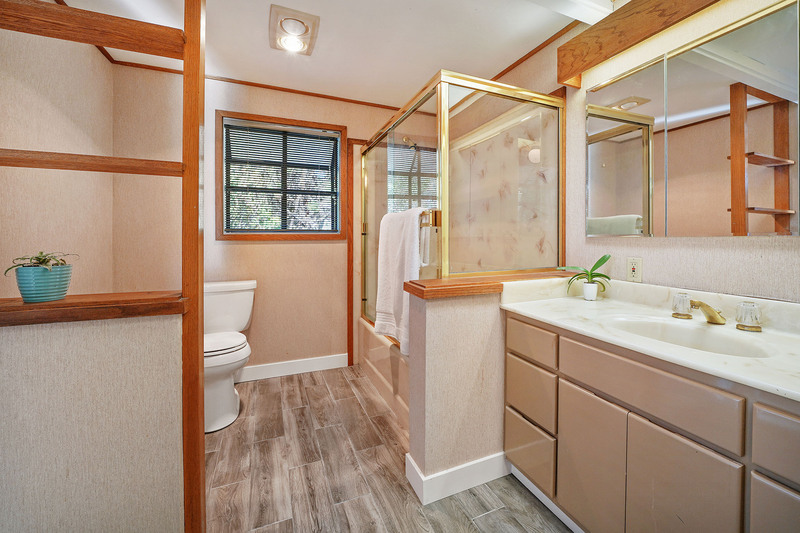 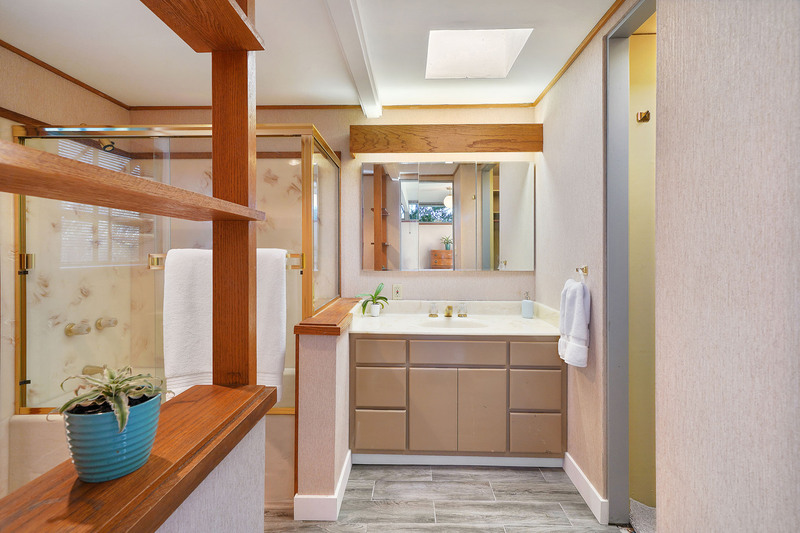 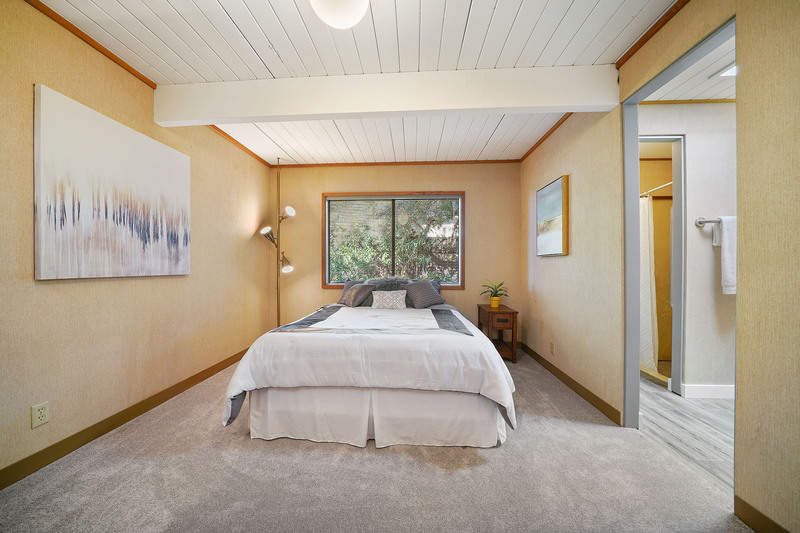 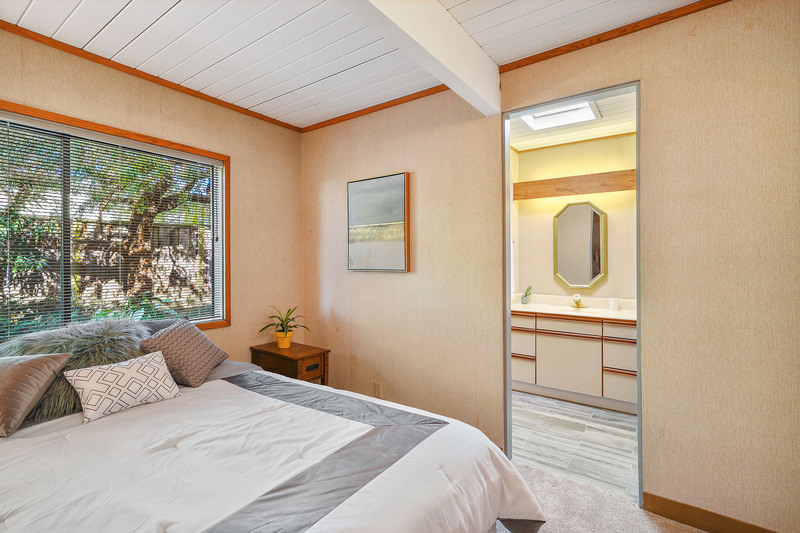 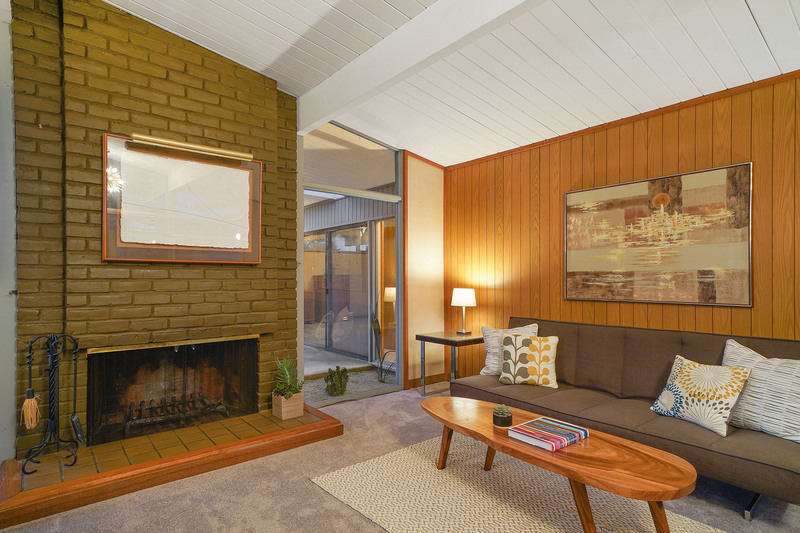 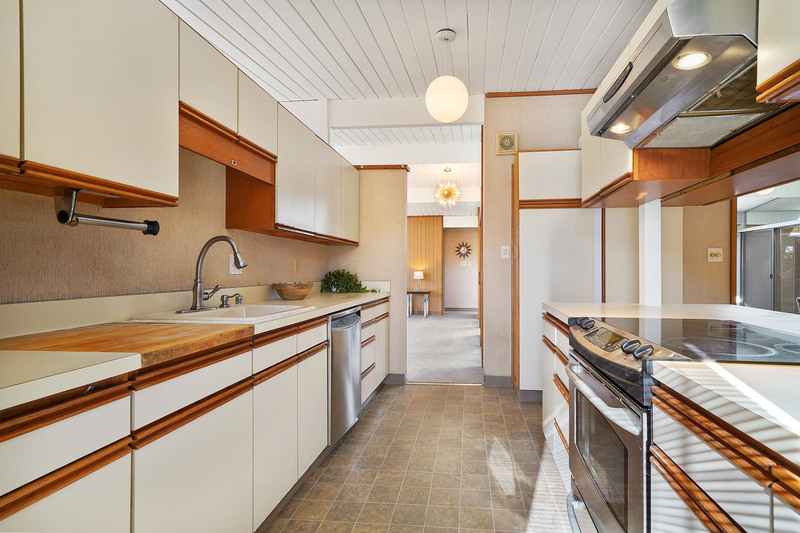 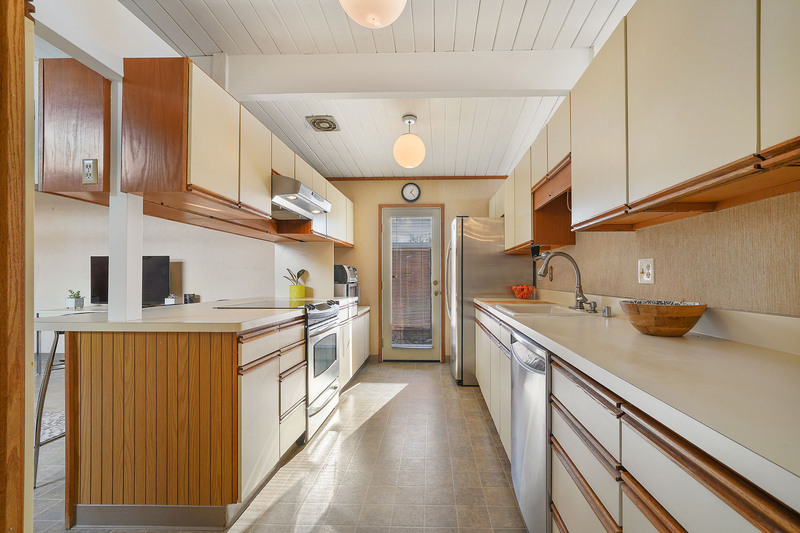 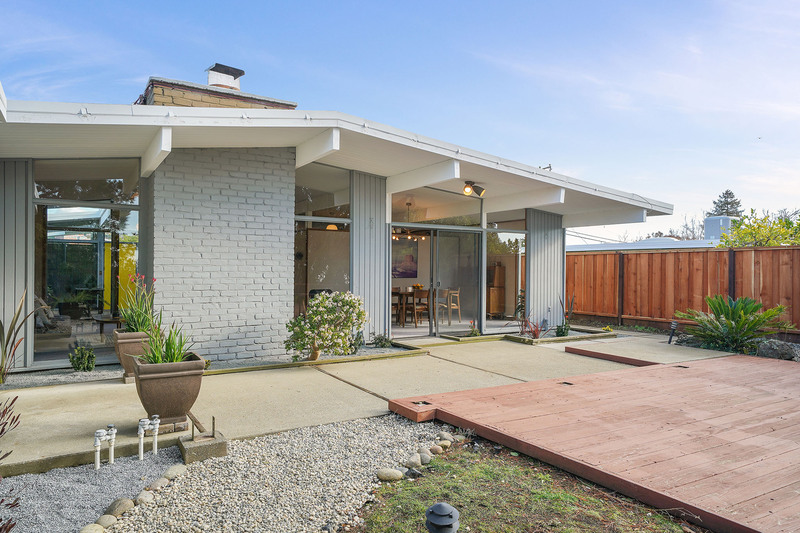 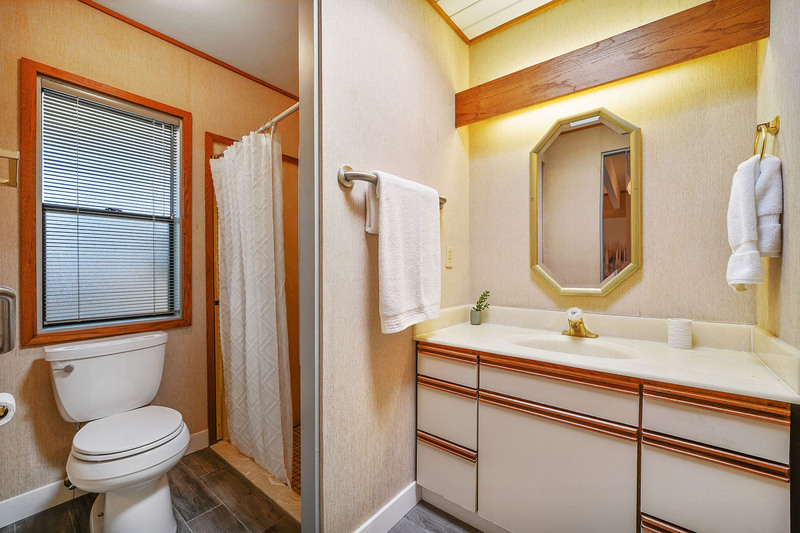 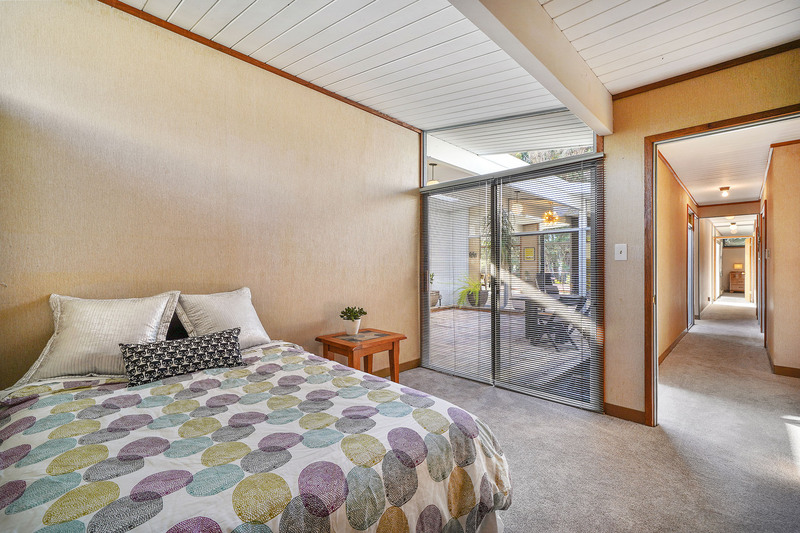 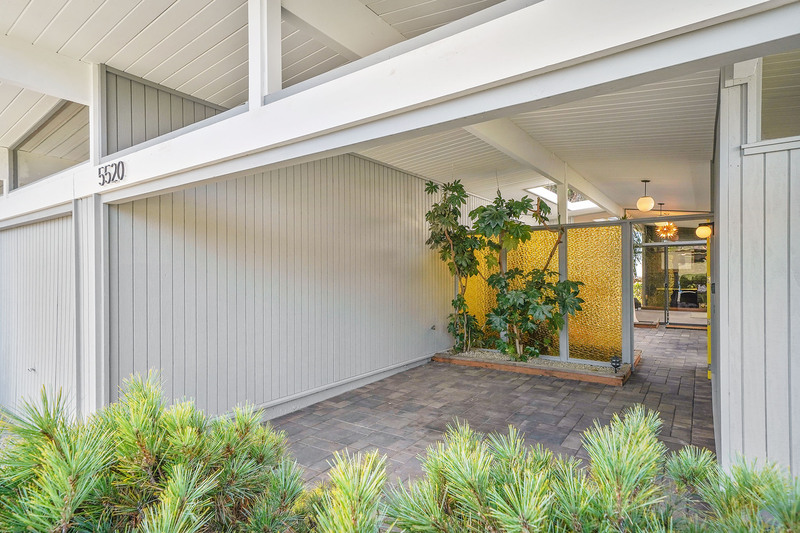 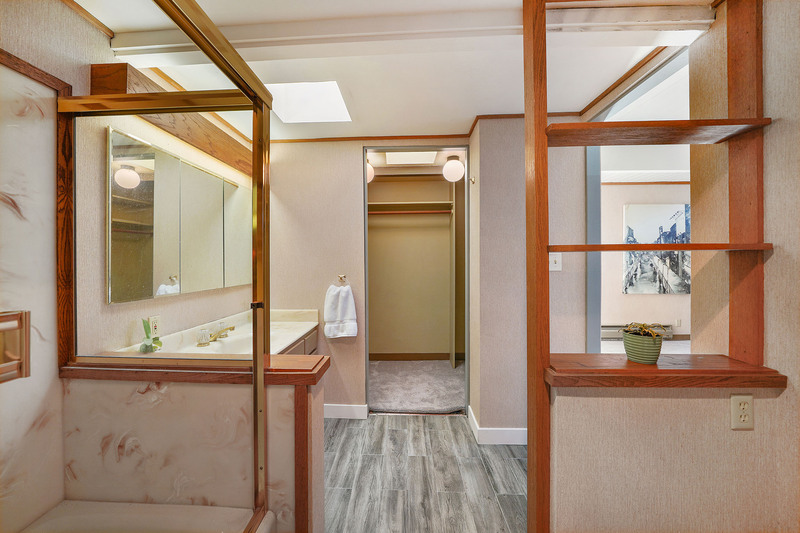 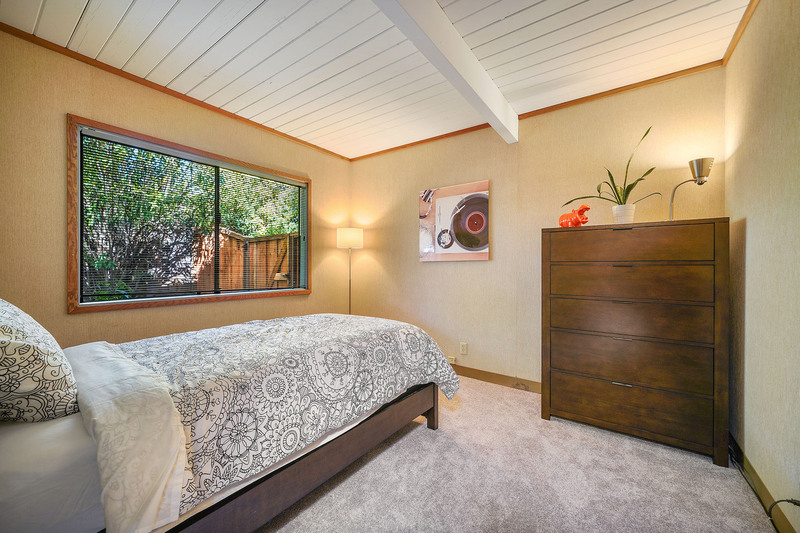 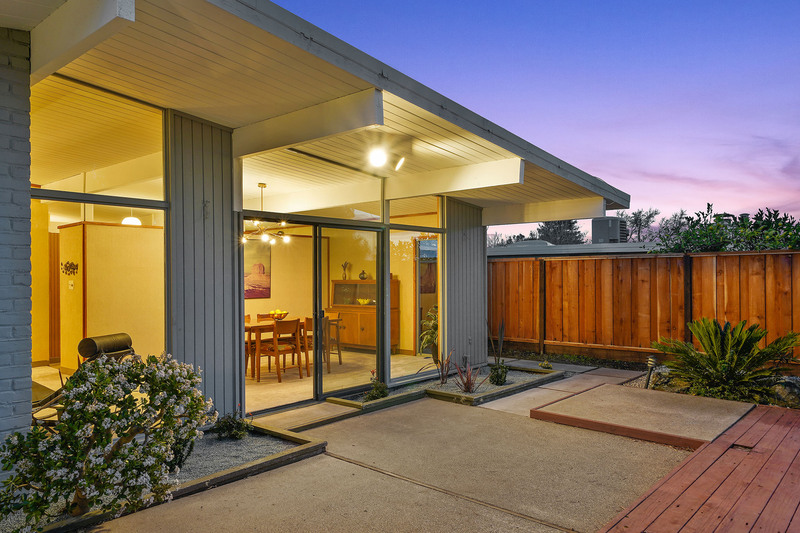 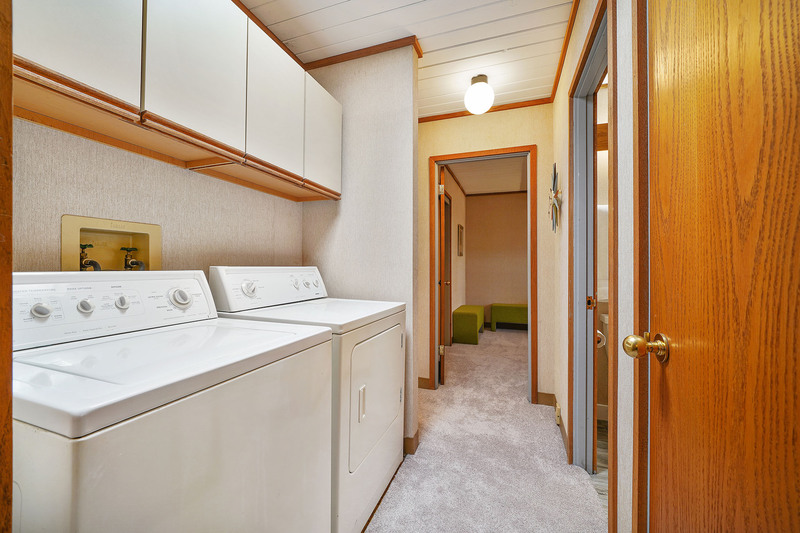 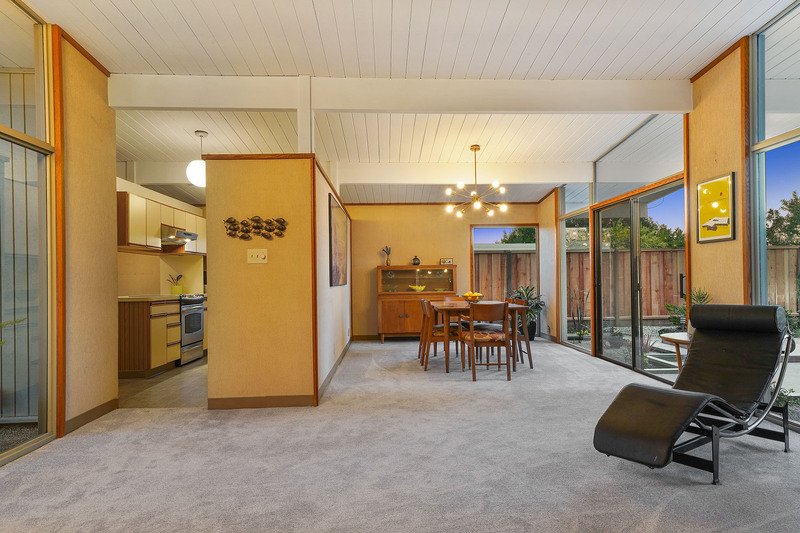 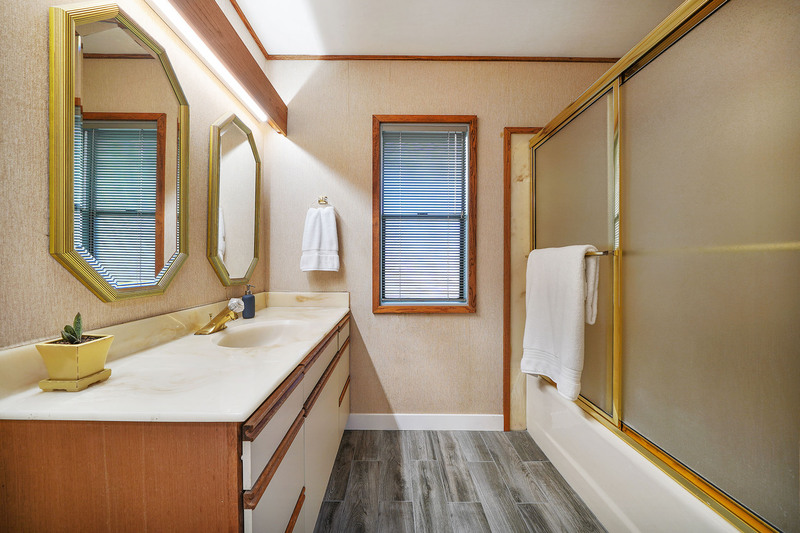 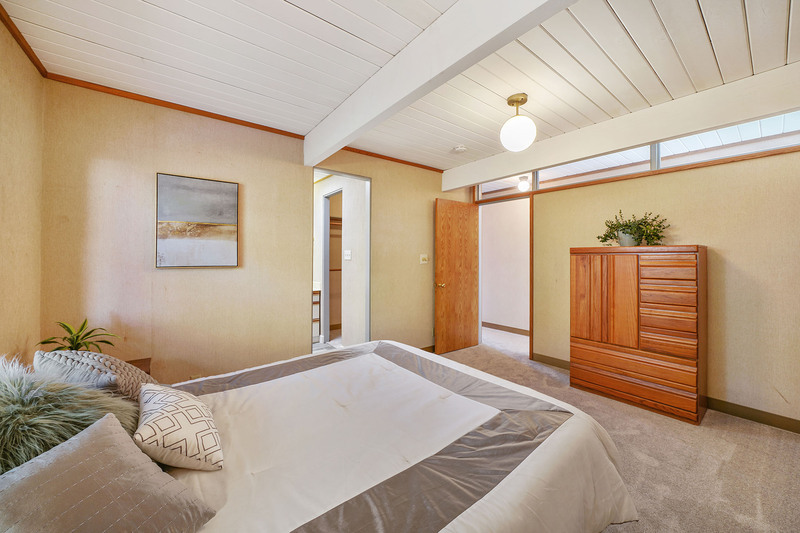 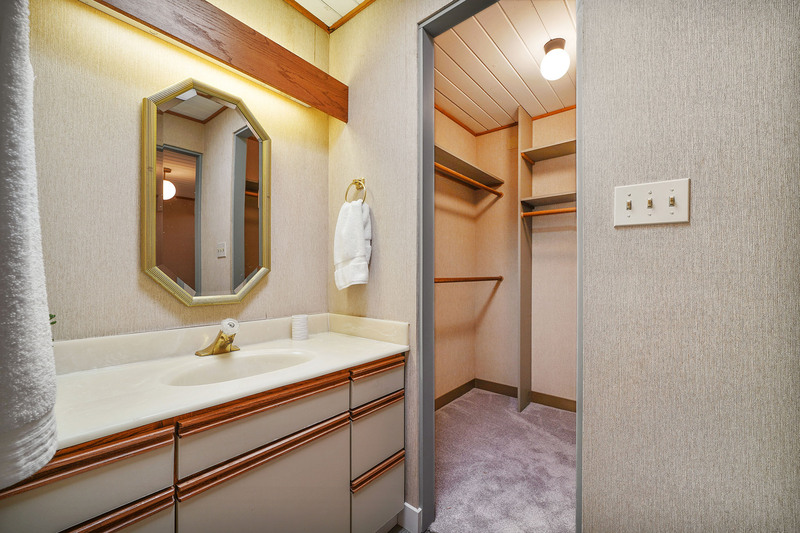 You’ll love the fact that this Eichler has been respectfully expanded with permits to create a unique 2,177 square foot single level 5 bedroom including 2 master suites, and 3 full baths home that’s ideal for a large or expanded family. 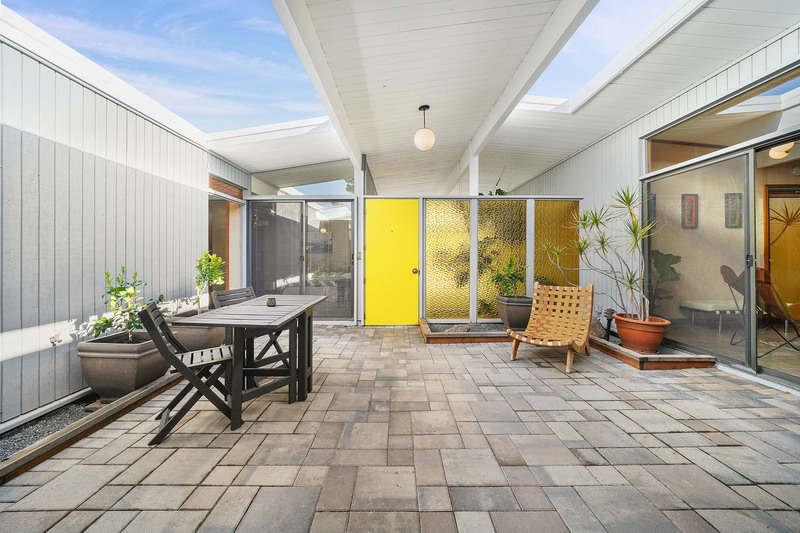 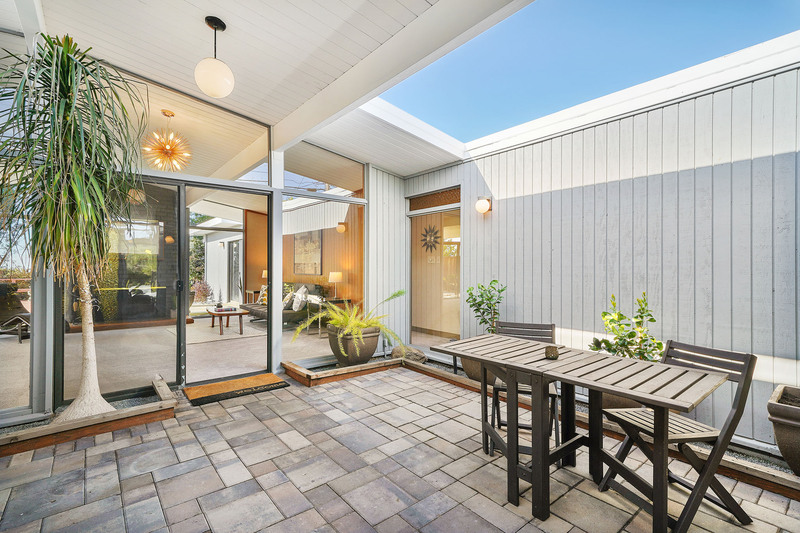 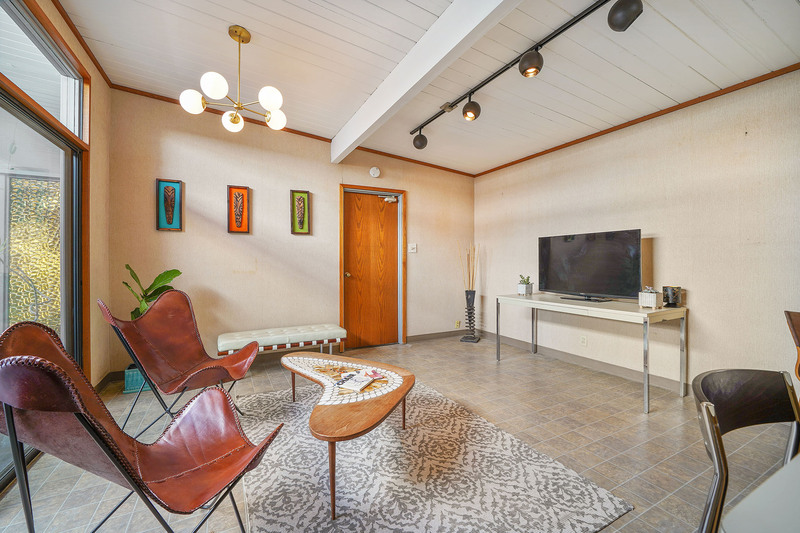 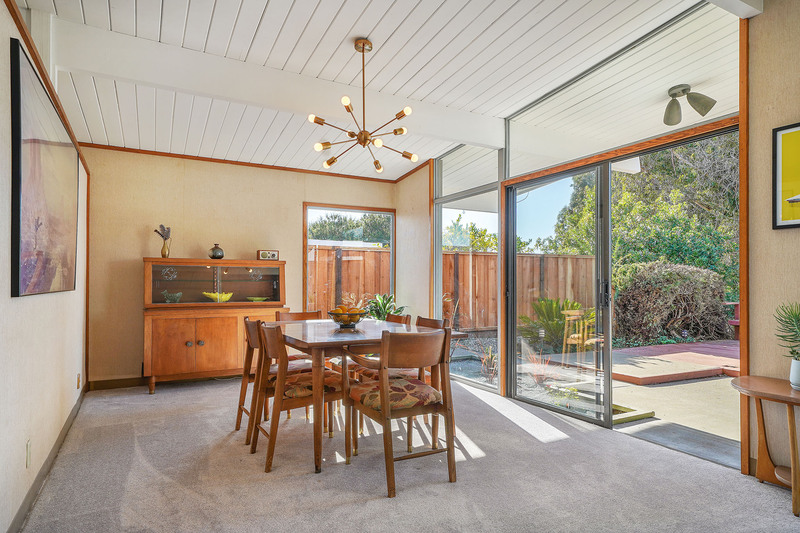 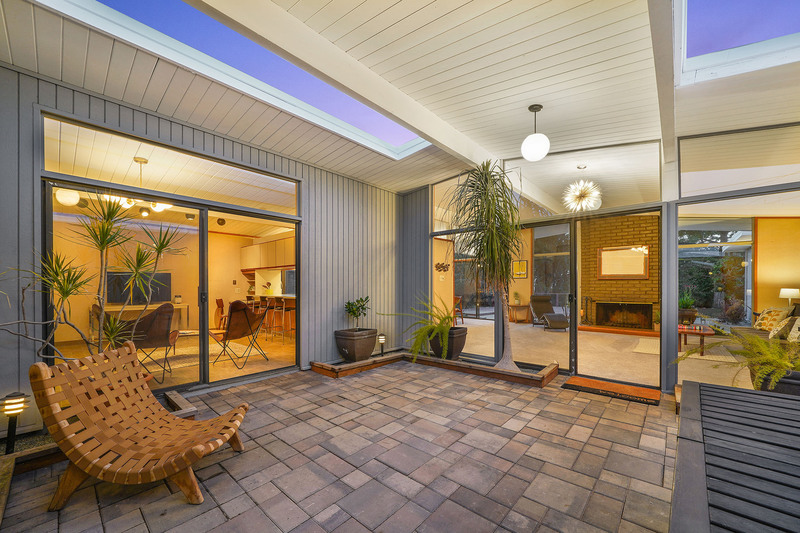 Everything you’d expect in an Eichler home is here including the signature open-air atrium, spacious great room with tongue and groove ceilings, floor to ceiling windows, and tons of natural light that epitomize the Eichler spirit of bringing the outdoors in. 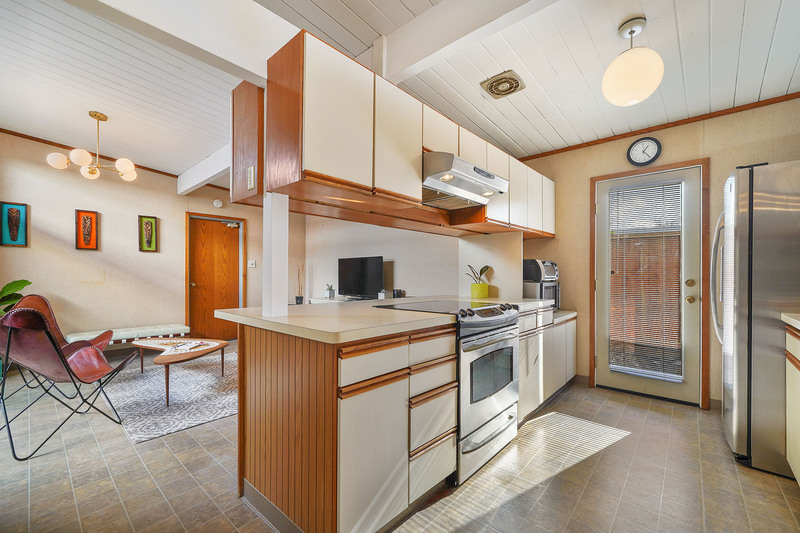 Other features include a large attached single car plus garage with carport, insulated foam roof to help keep cooler in the summer and warmer in the winter, radiant heating with copper lines, new carpeting throughout, new exterior and interior paint in designer colors, new fencing, new tile in the baths, multiple skylights, period lighting, a wood-burning brick fireplace, and more. 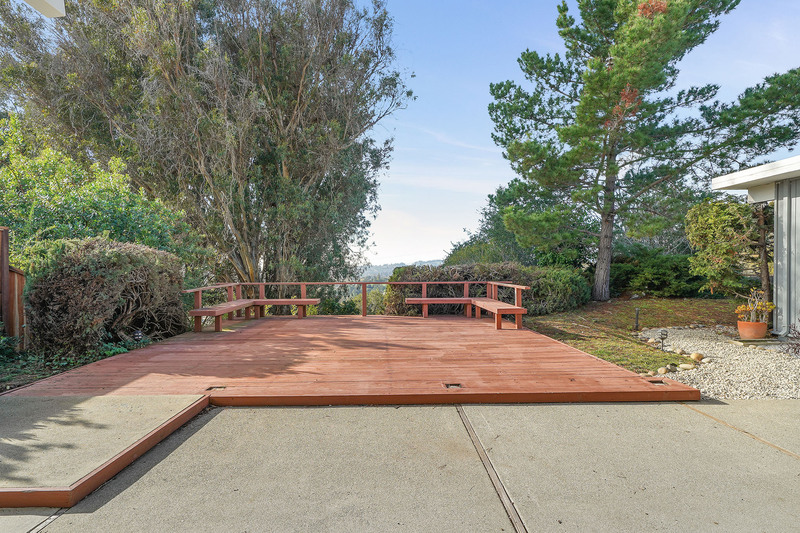 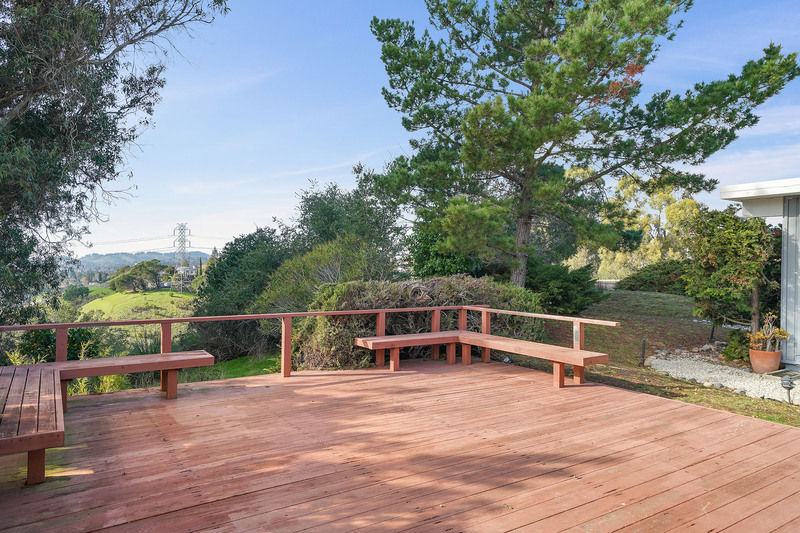 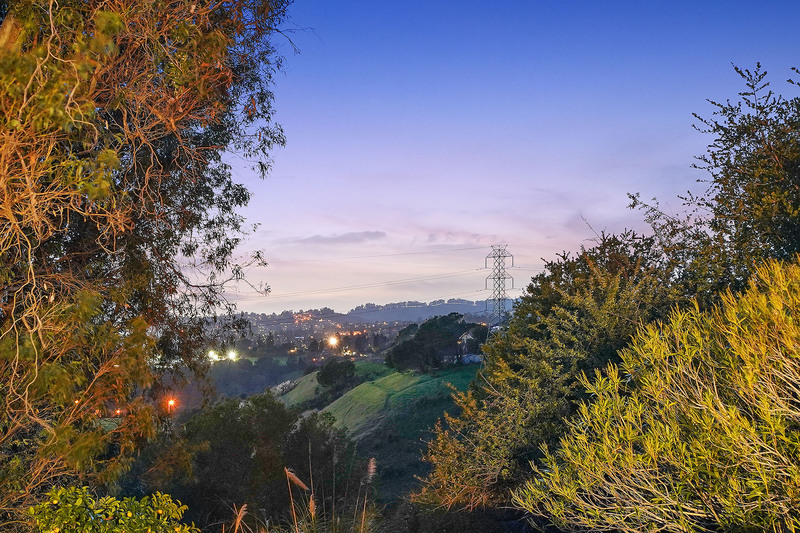 Located in Castro Valley’s desirable Greenridge neighborhood on the highly coveted west side of the hill on a massive private lot of over 14,700 feet per tax records, with views of the canyons, hills, and peekaboo views of the Bay with huge potential to improve. 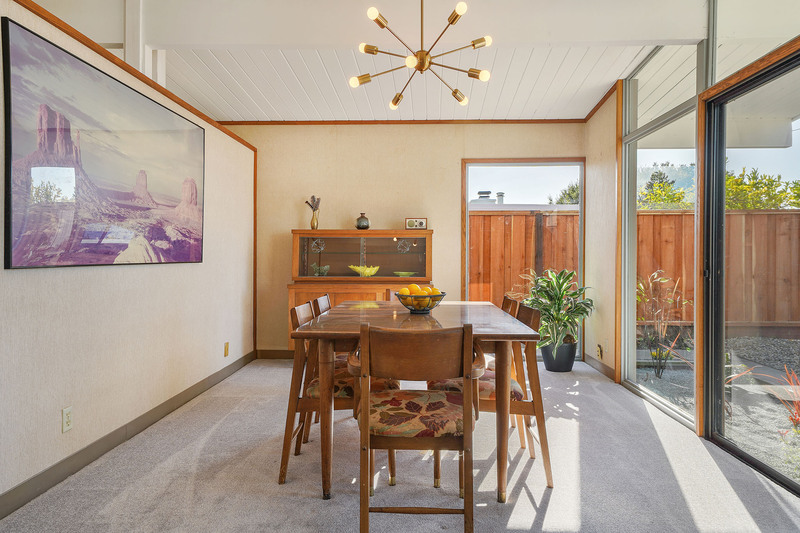 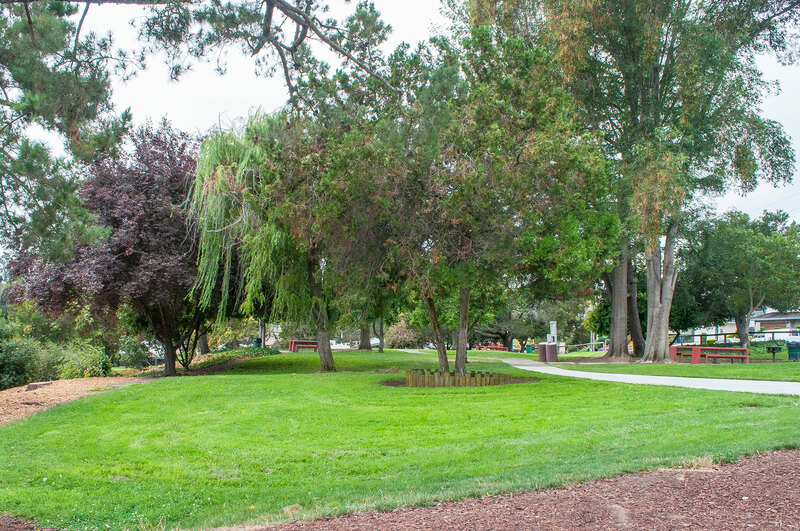 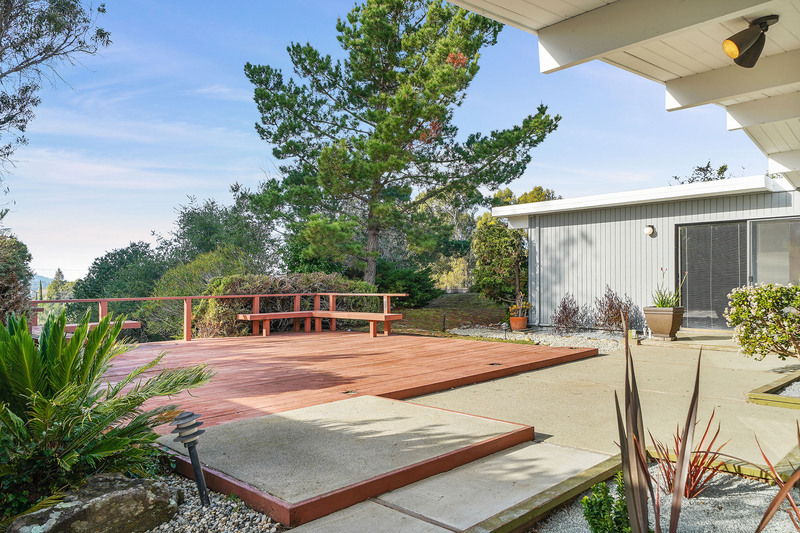 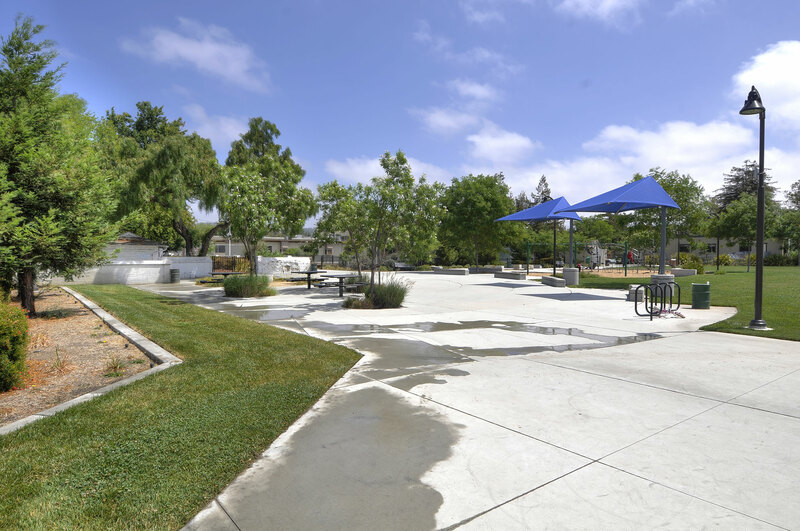 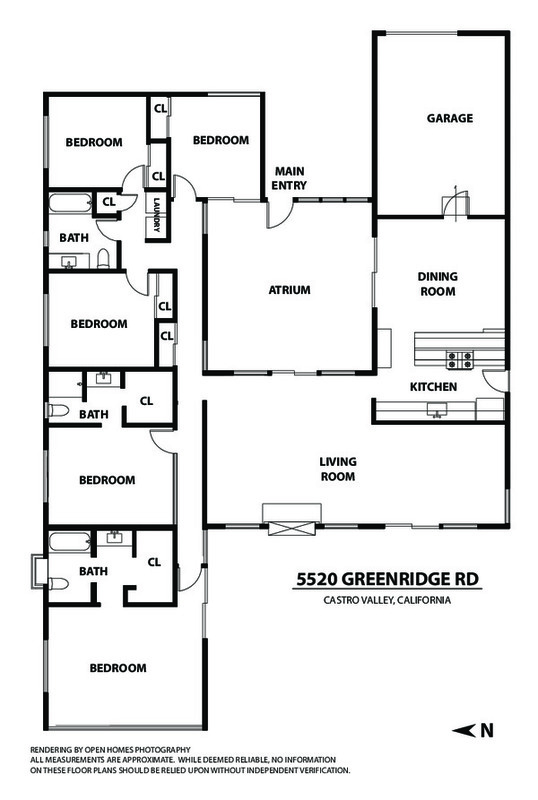 The Greenridge Eichler community is one of Castro Valley’s premier neighborhoods featuring award-winning schools, temperate weather, and great parks and recreation. 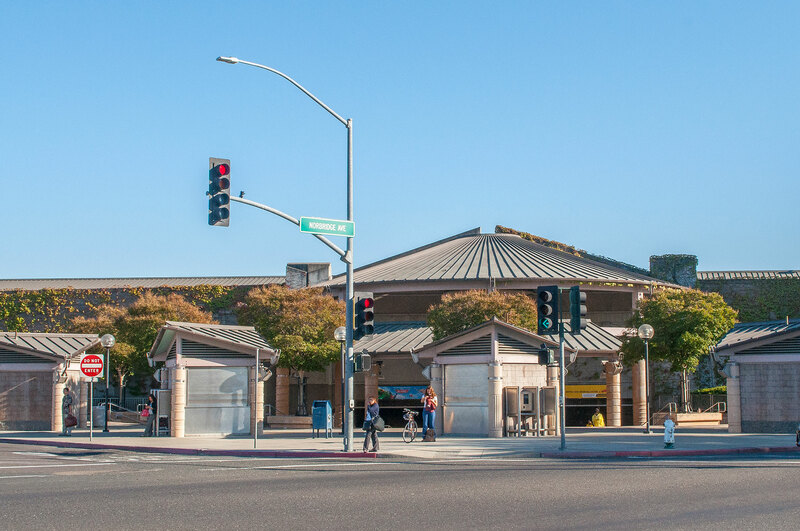 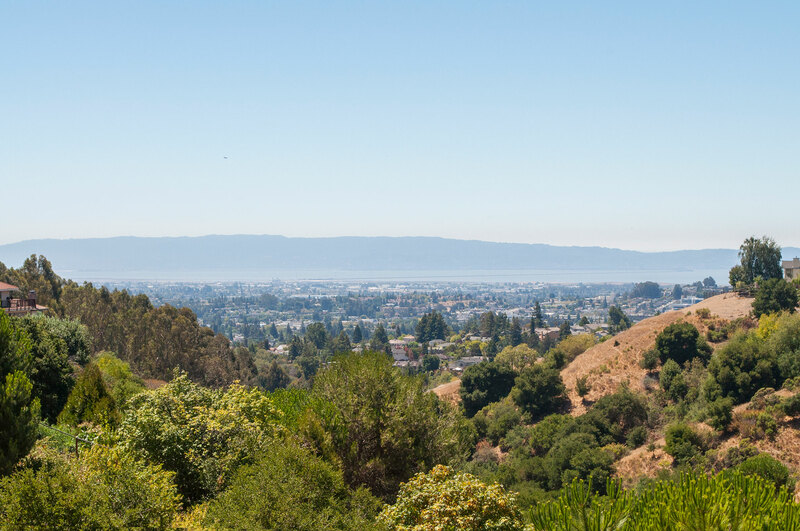 Castro Valley is located in the heart of the Bay and is very commuter-friendly with the convenience of BART and multiple freeways. 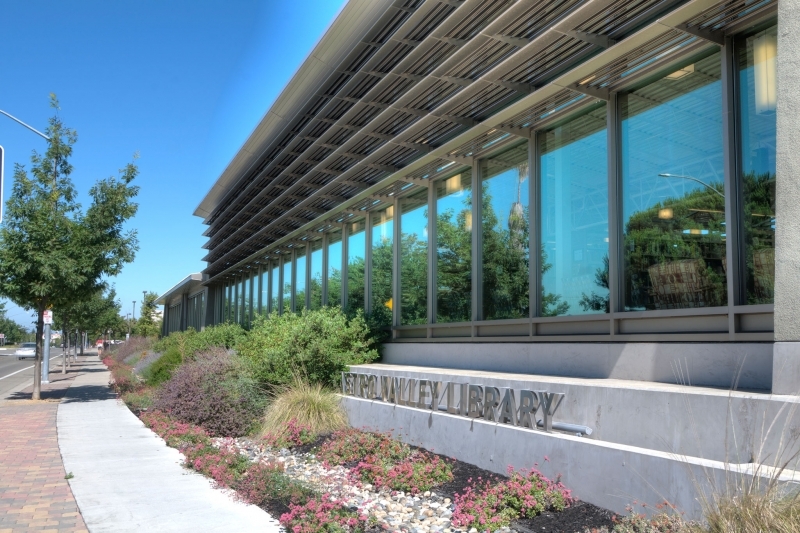 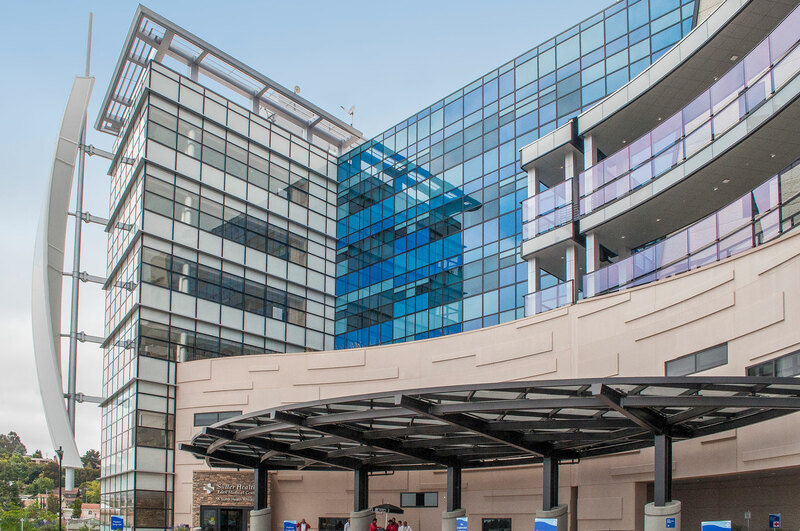 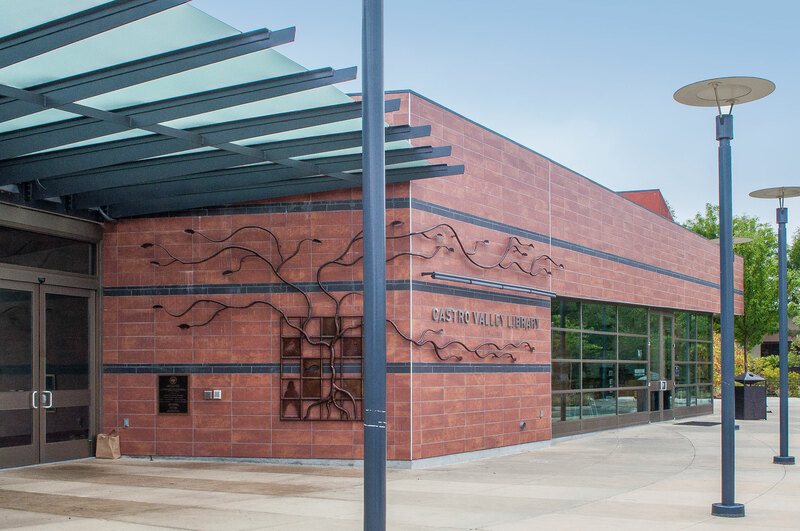 Castro Valley is also home to a stunning contemporary library, renovated downtown area, and the new Eden Hospital. 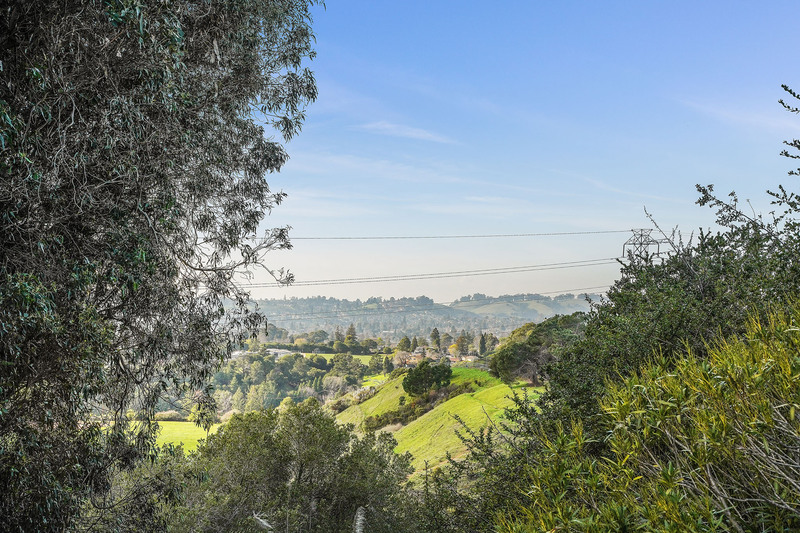 Nestled in a quiet valley surrounded by oak-studded rolling hills, Castro Valley enjoys a rural atmosphere in the midst of urban Alameda County. 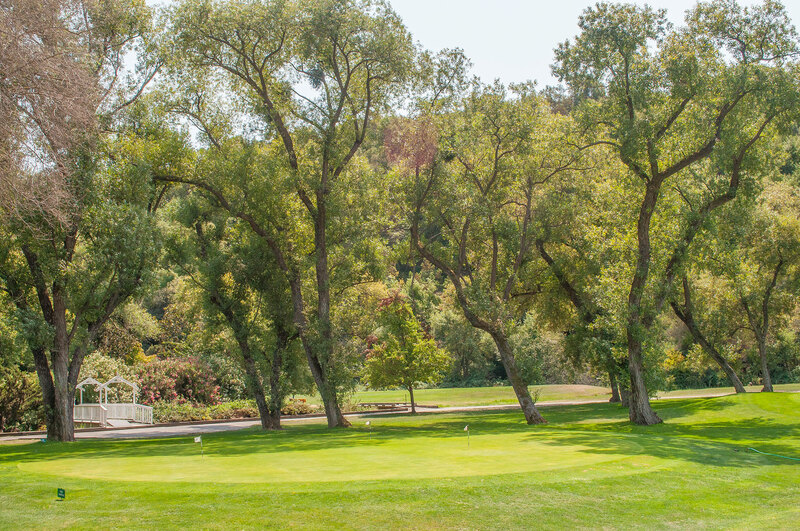 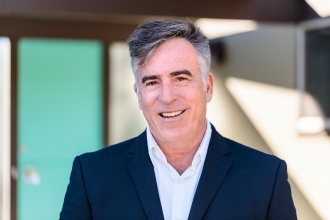 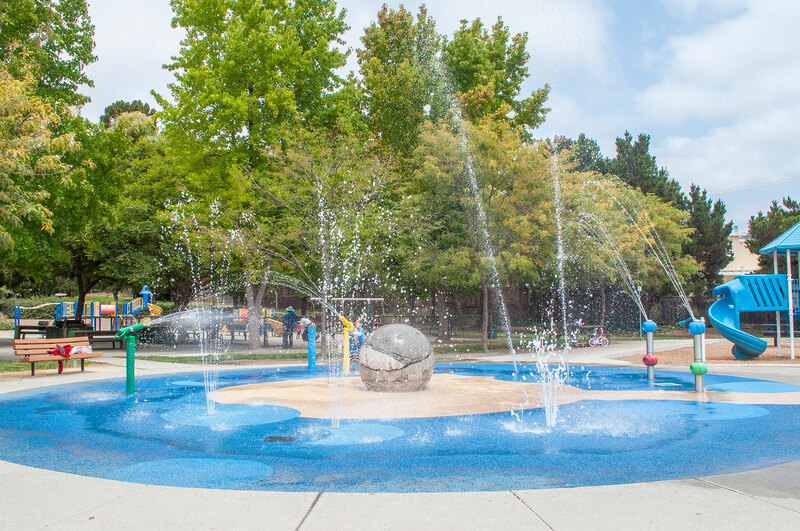 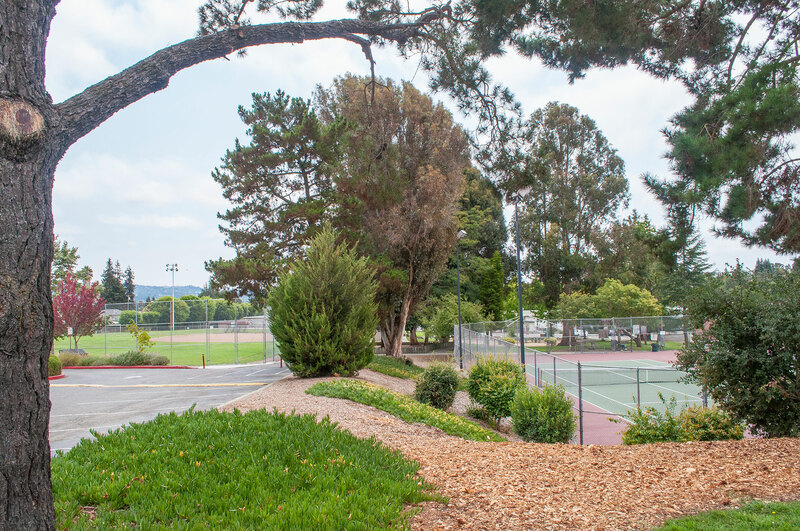 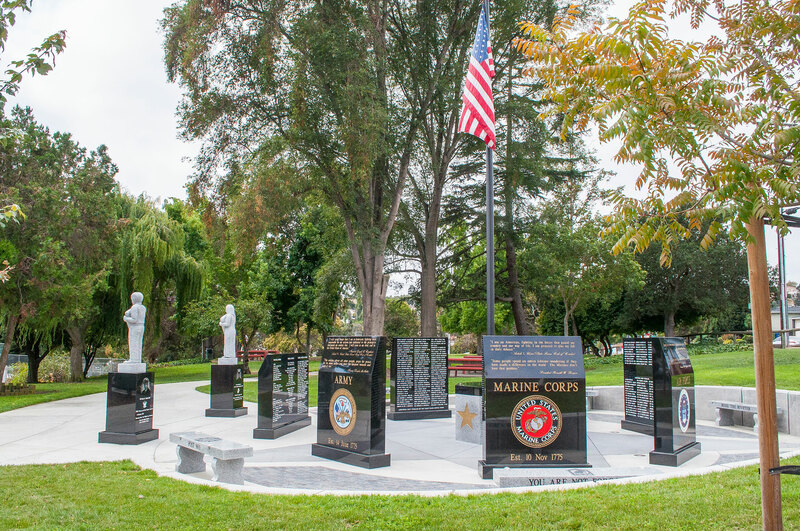 With the San Leandro Hills extending along its northeastern edge, Castro Valley boasts such natural amenities as an extensively developed park system, a swimming lagoon, and an 18-hole golf course. 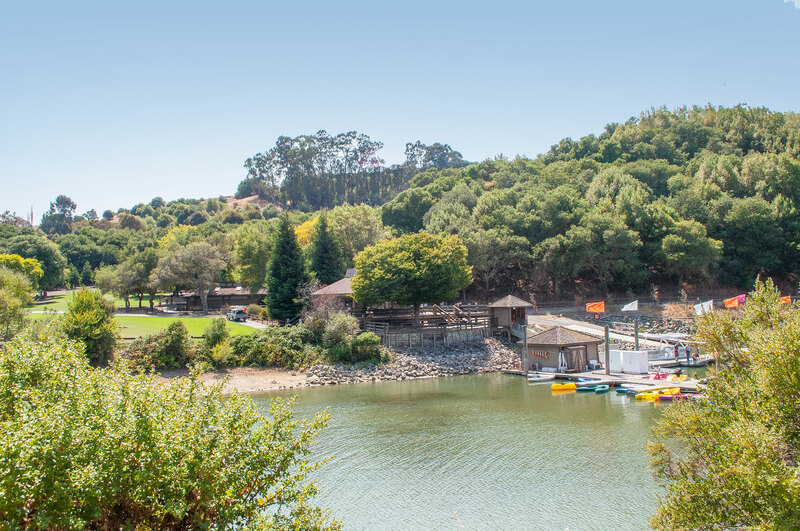 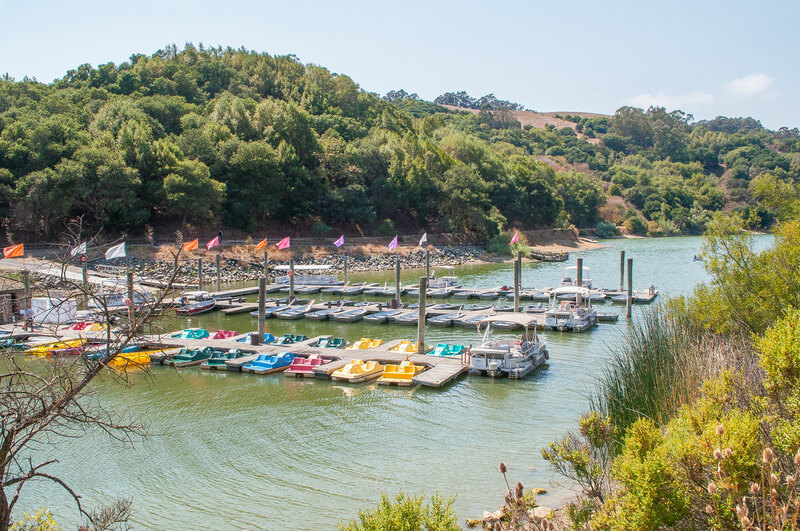 Lake Chabot Regional Park offers boating, hiking, and an annual spring fishing derby. 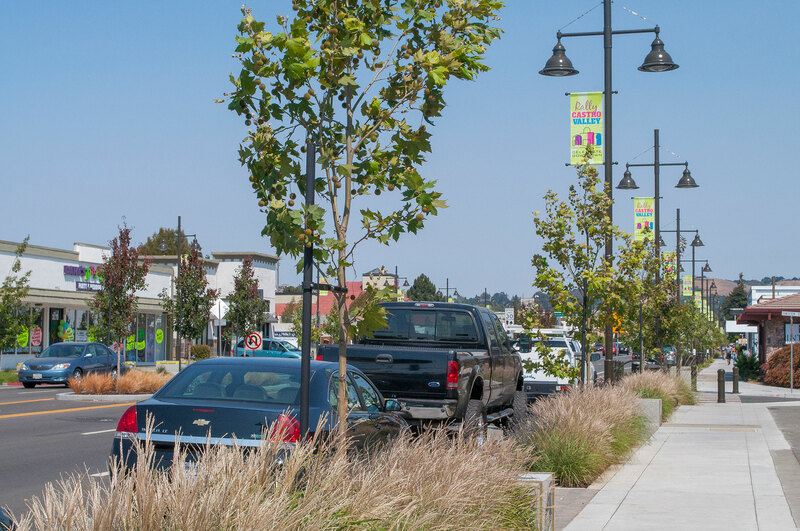 This vibrant community of a little more than 60,000 residents hosts an annual fall festival and car show, a chili cook-off, and a rodeo parade. 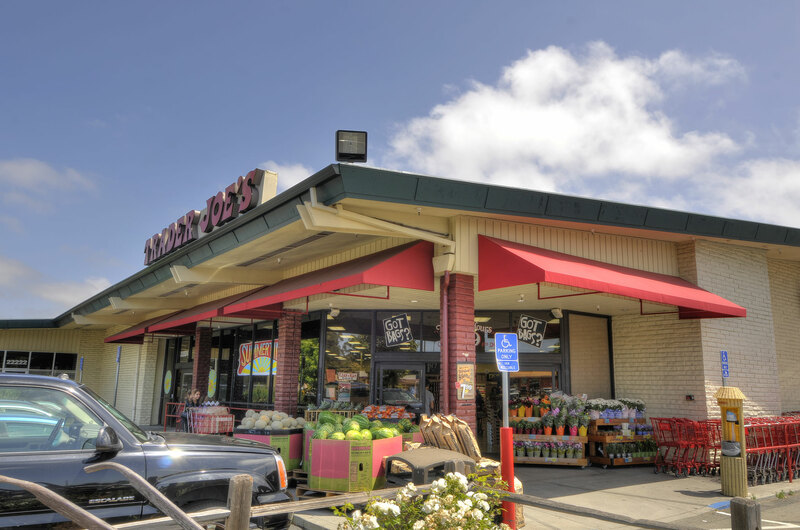 Seasonal farmers' markets sell fresh produce from the nearby Central Valley. 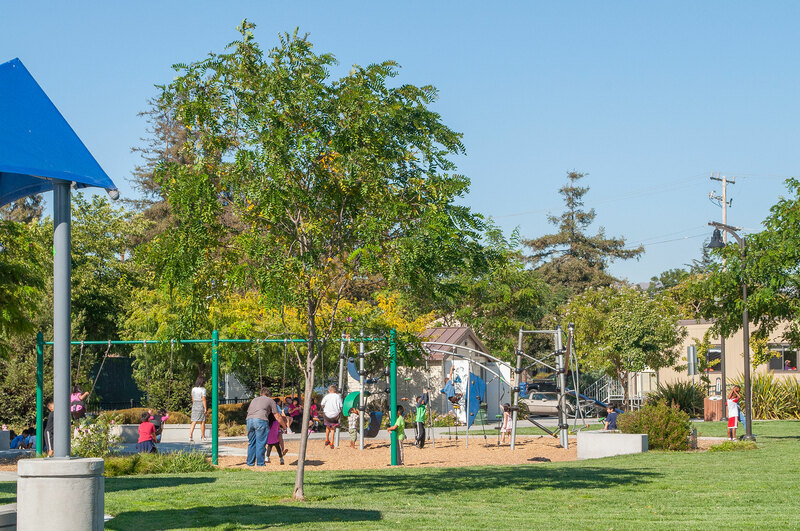 Youth activities include softball, baseball, soccer, and basketball leagues, as well as a track club. 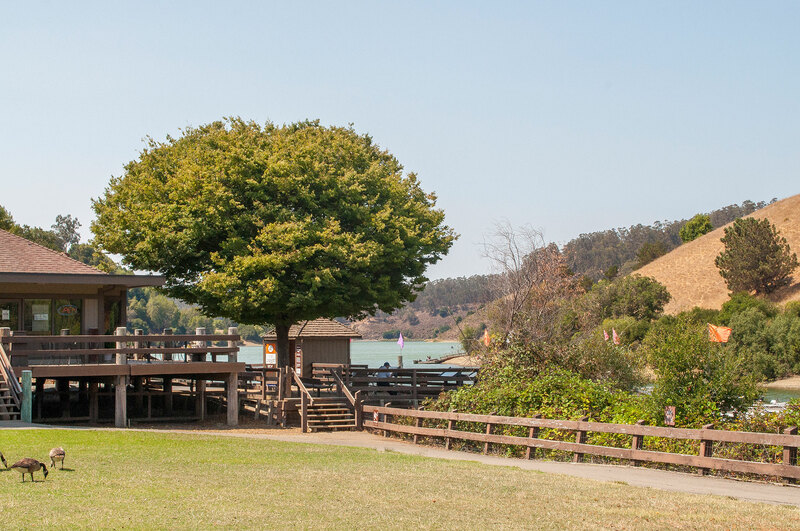 Historic Rowell Ranch Rodeo holds rodeo events and chooses a Rodeo Queen each year. 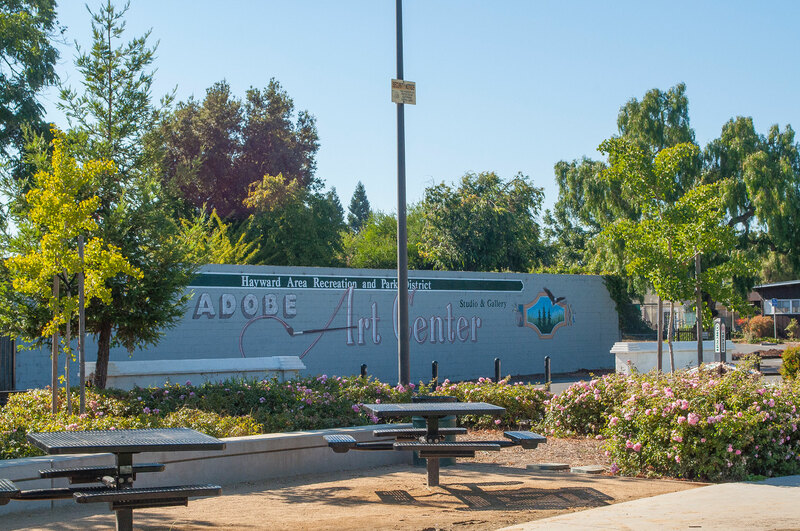 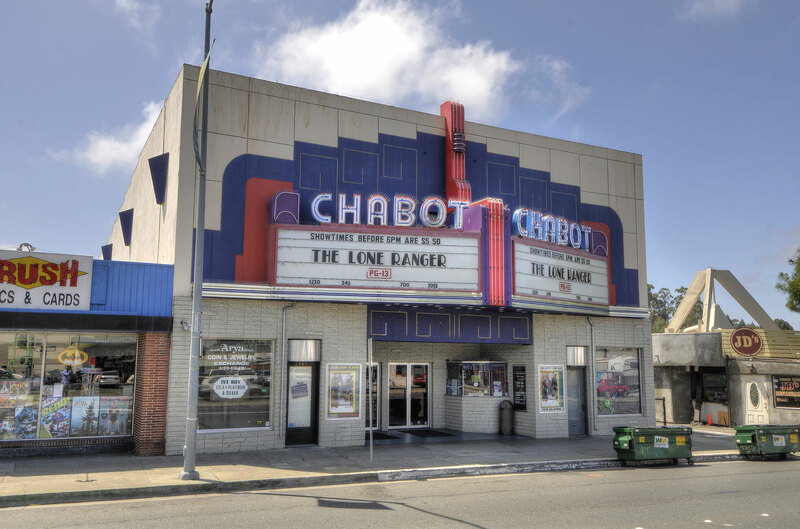 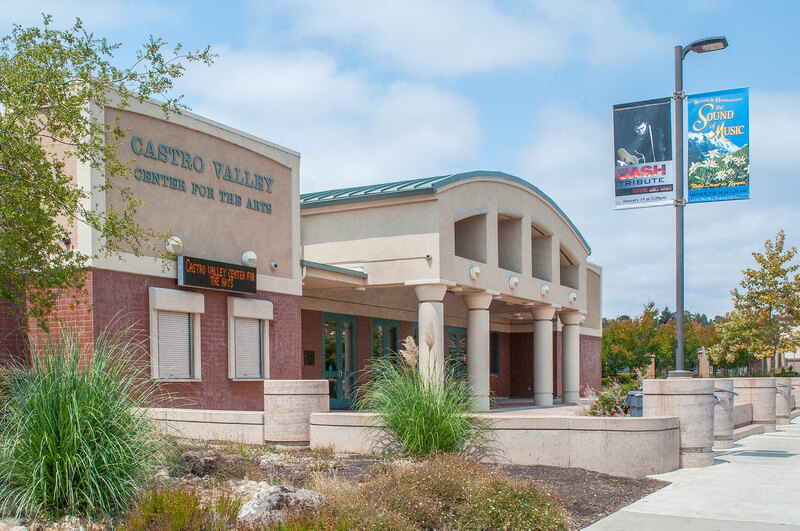 Castro Valley’s Adobe Art Gallery displays group art exhibits, student exhibits, and children's and senior art. 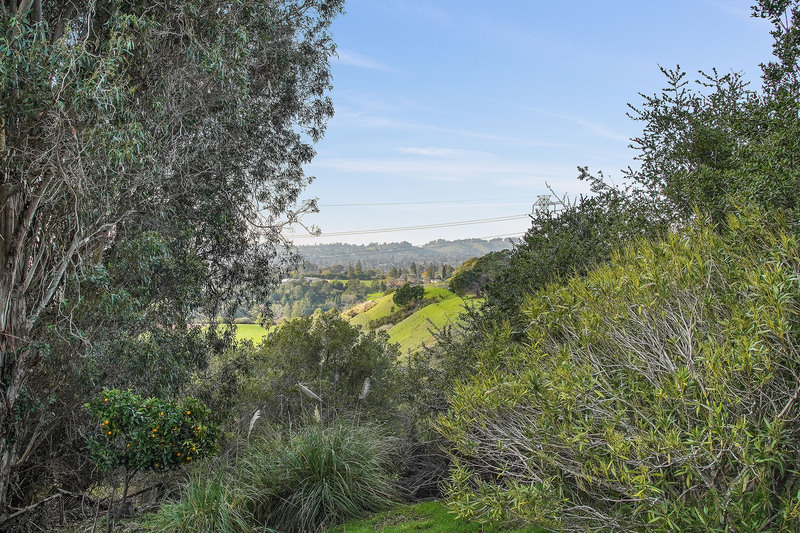 Castro Valley homes range from 10-acre properties with plenty of room for horses to custom-built homes with views of the surrounding hills and three-bedroom, single-family homes close to schools and shopping.